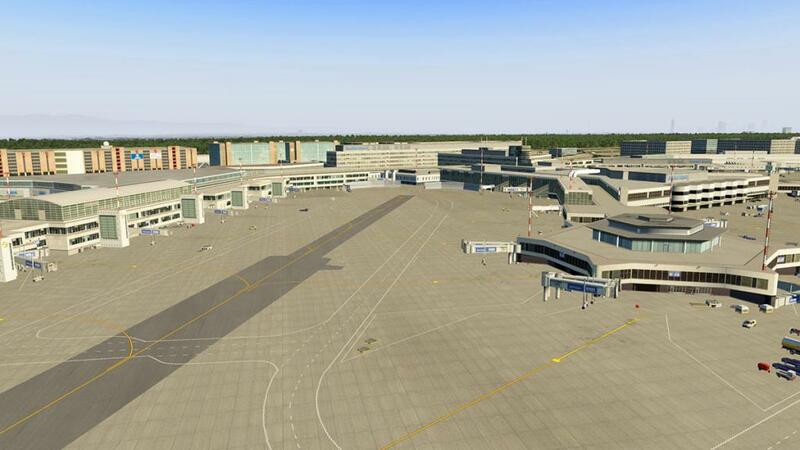 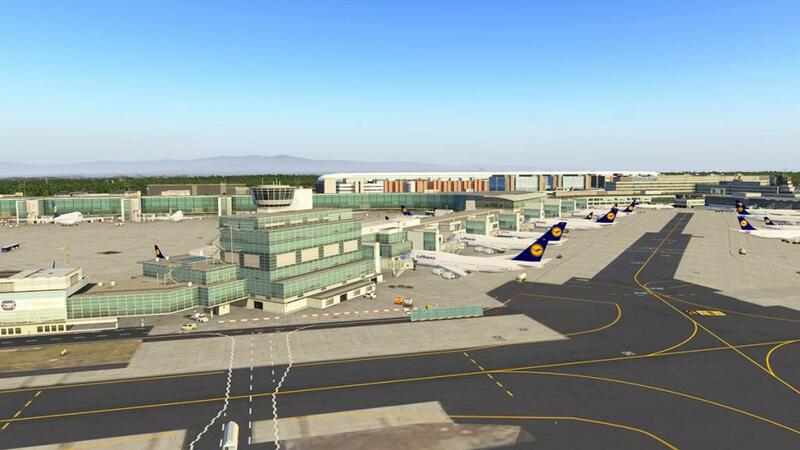 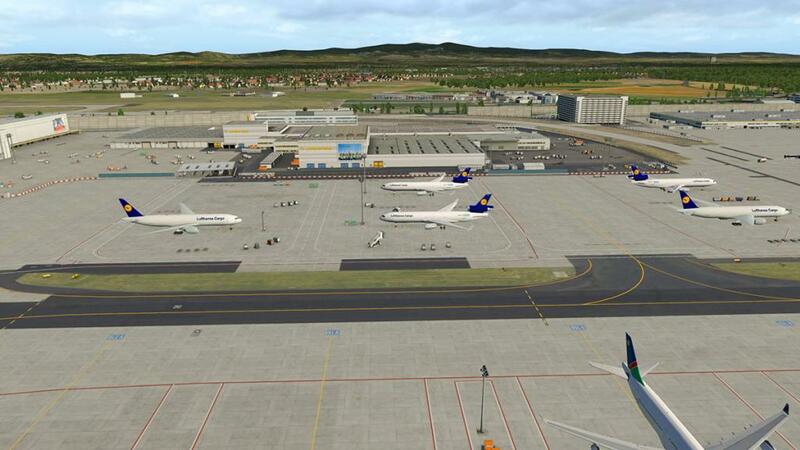 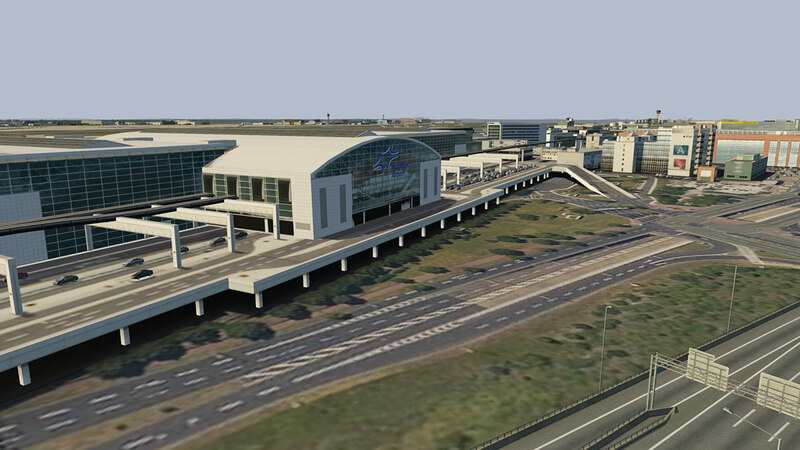 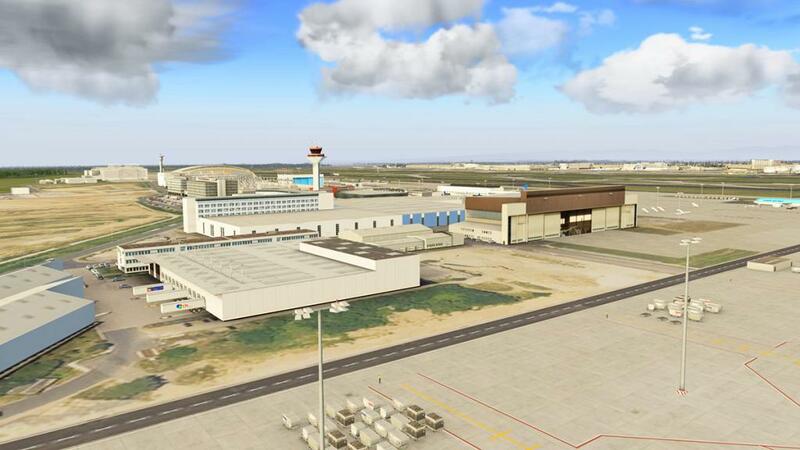 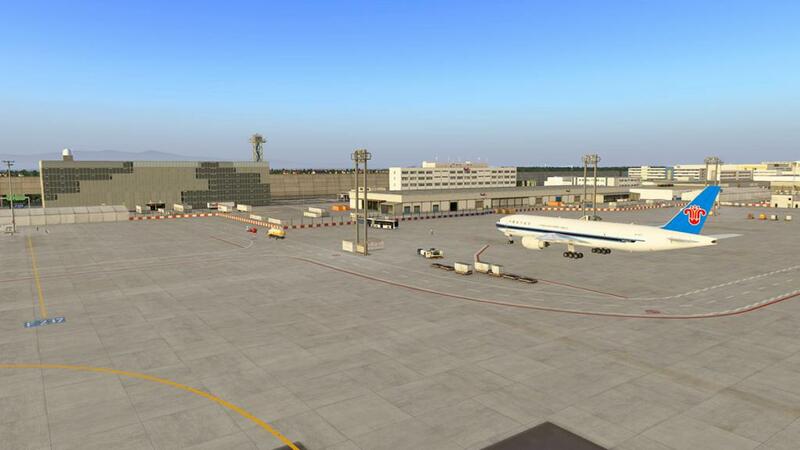 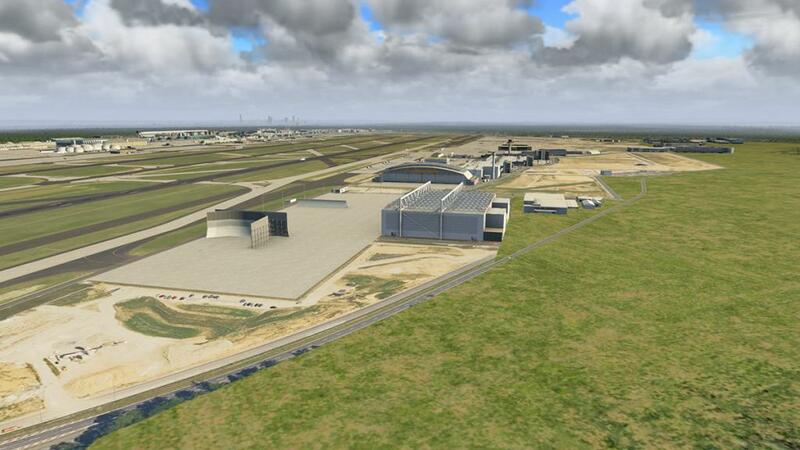 From the earliest days of Aerosoft providing scenery to the X-Plane simulator there has been a custom Frankfurt International airport in "Aerosoft - Frankfurt". 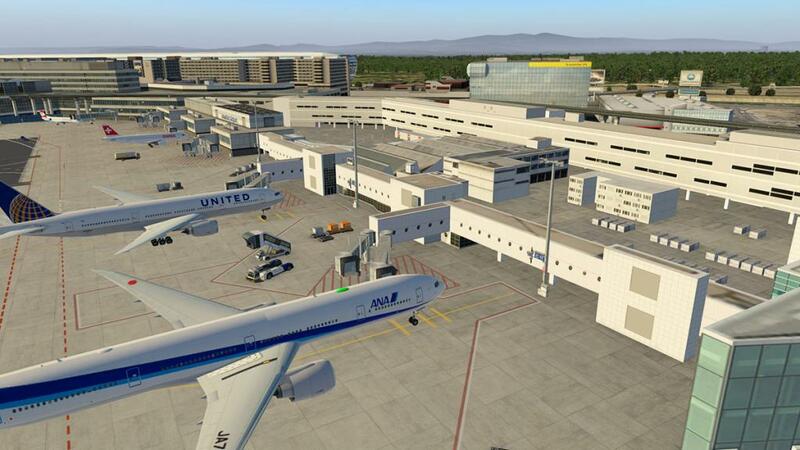 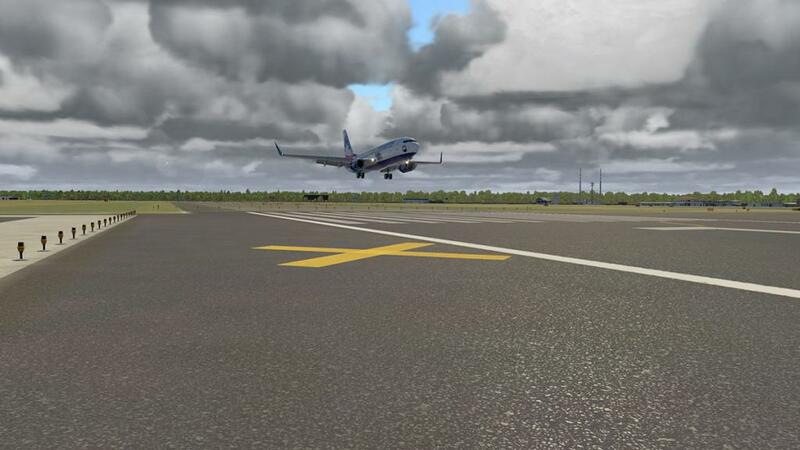 This scenery was provided free with the introduction of X-Plane10 (X-Plane boxed set "Global Edition") and was made as were a few other Aerosoft airports in being in the default scenery and loaded into X-Plane as part of the main download or any update of the simulator... 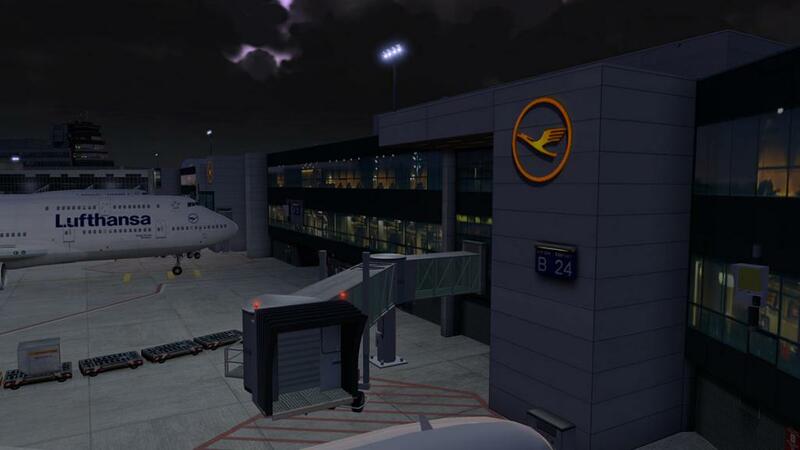 In other words you got the EDDF scenery if you wanted it or not. 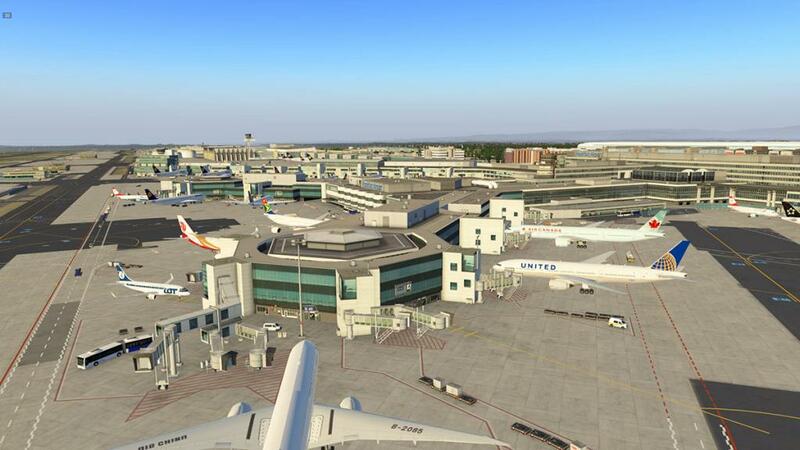 By early X-Plane10 standards it is pretty good, so what was my problem? 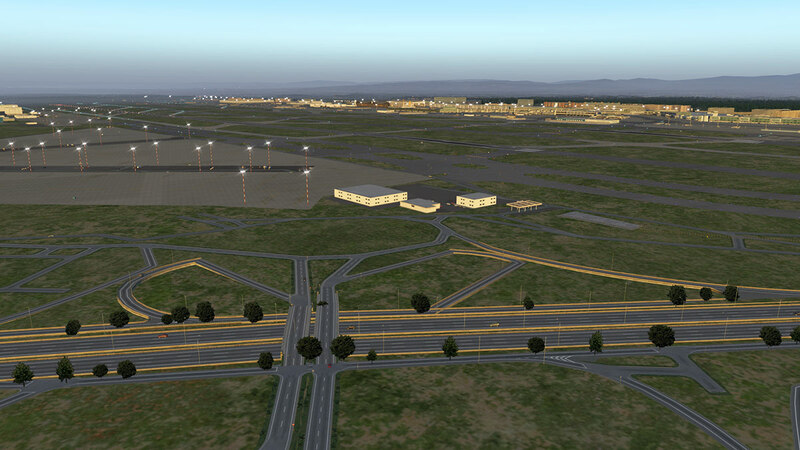 Mostly it was in the way that Aerosoft were at the time not very good at using the intergration between their own ground textures and the X-Plane default textures and creating bands of nothing around the airport scenery... here at EDDF there wasn't actually any custom ground textures but still the empty spaces around the airport didn't use the autogen or the extensive default traffic system to their best advantages, so you always sort of got an airport that was isolated out there like an island feel. 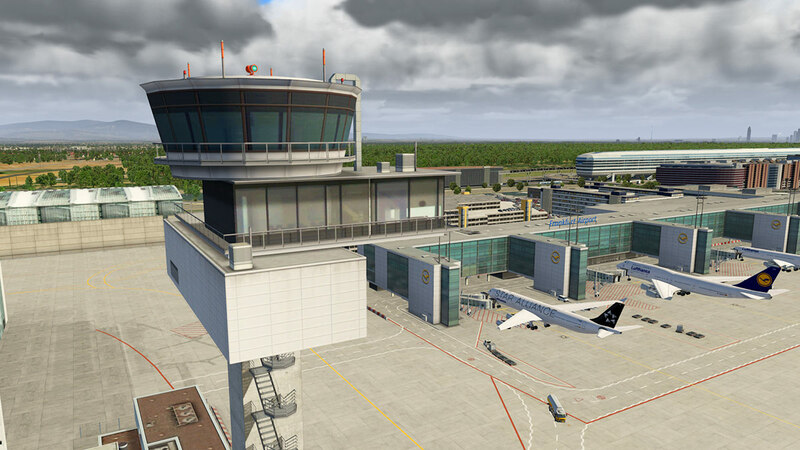 The airport buildings themselves are still pretty good, but the lower resolution does show, the scenery surprisingly is also heavy as well on your framerate for so little visually. Many users worked hard to fill in this default EDDF and were very successful for their extensive efforts as the basics are quite good to work with, but in reality you were working to fix something that was compromised in the first place. 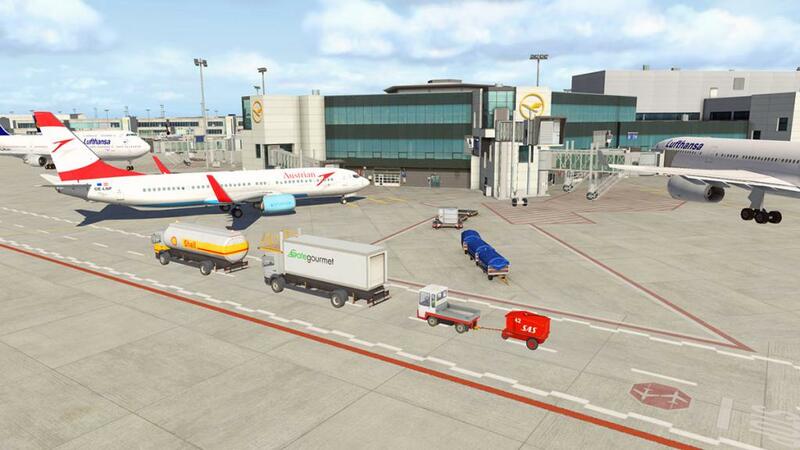 Overall because of Aerosoft's supreme reputation you expected far, far better so overall you were disappointed in this EDDF even if it was free. 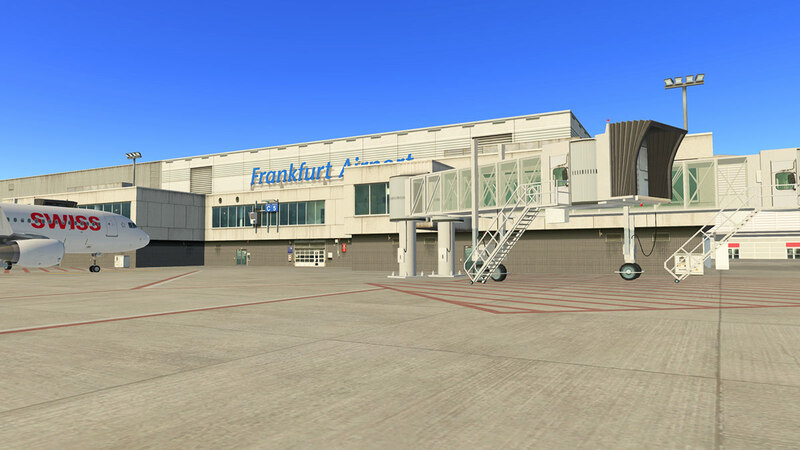 ... but this EDDF - Frankfurt is absolutely nothing like the original version, quite simply it is excellent, and yes this scenery has that first time look of the "wow" factor, and I have already done six flights to EDDF and that is more flights to Frankfurt in one week than I have flown to the airport in the last five years. 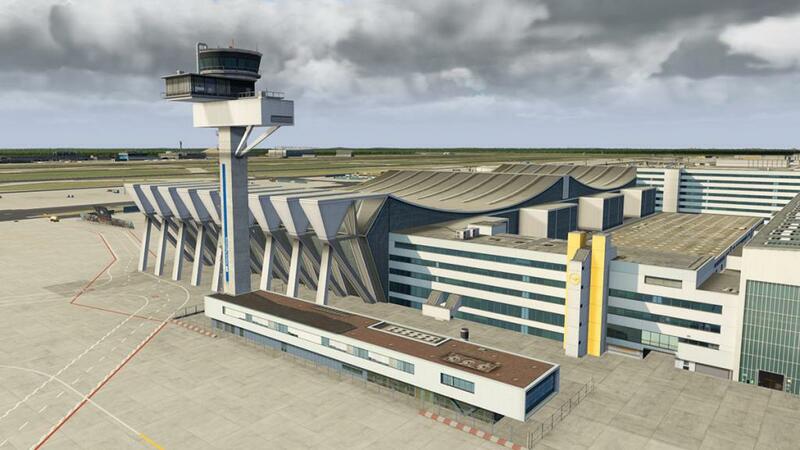 The so called "wow" factor is highlighted by certainly the X-Plane11 dynamics, but also by some other more important reasons which we will cover in this review, but the biggest change is really in the attitude of Aerosoft itself and the approach of the way they are now creating scenery for X-Plane. So let us now do first an overview of EDDF. 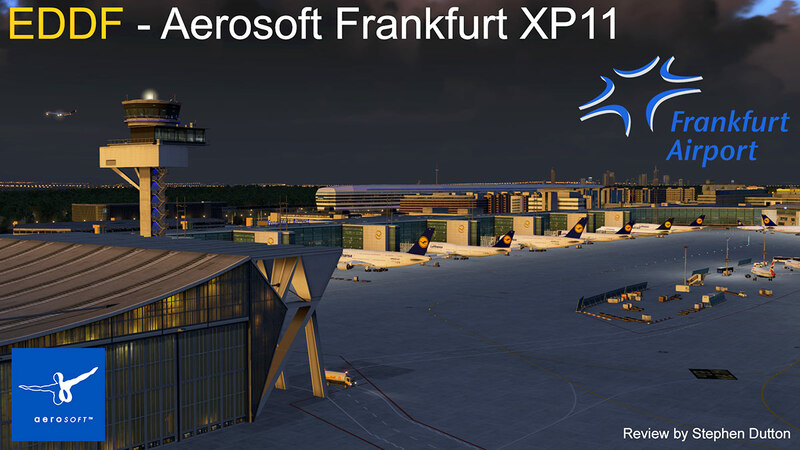 Your first overview impression is that Frankfurt XP11 is really well now intergrated into X-Plane. 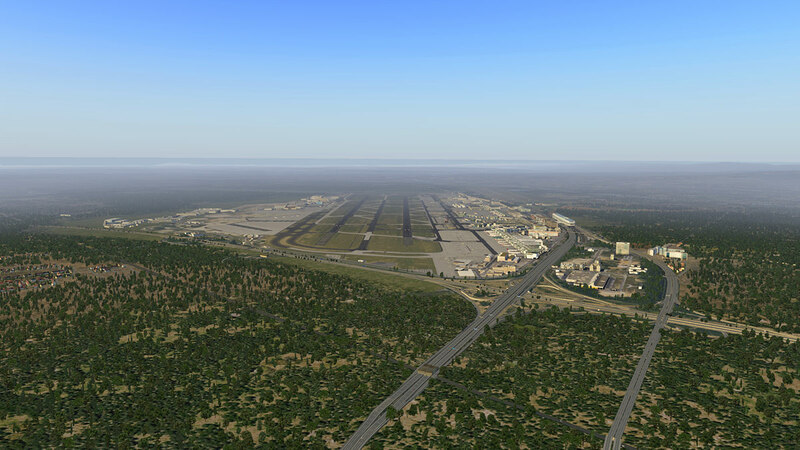 The old bland layout setting has been totally wiped, with now the excellent ortho ground textures and well set out trees. One bonus of X-Plane11 is you also get the default German autogen and that looks great as well, but it comes with a big stick... there is a lot of autogen around EDDF (mostly to the north) and at full object settings it can be very heavy on your framerate... if you can run that setting then great for you, but even I had to pull the setting back one notch as shown here. 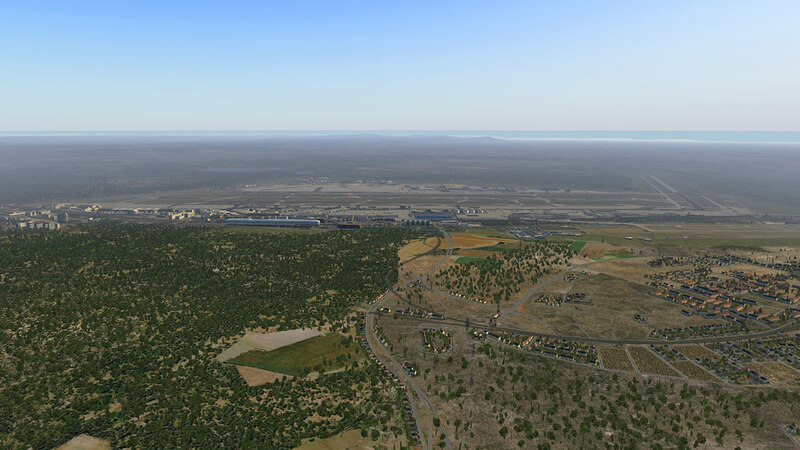 You don't lose too much in the visual sense with the setting down a notch and considering the huge to massive object count in this scenery, the framerate count is very good if not excellent at this setting. 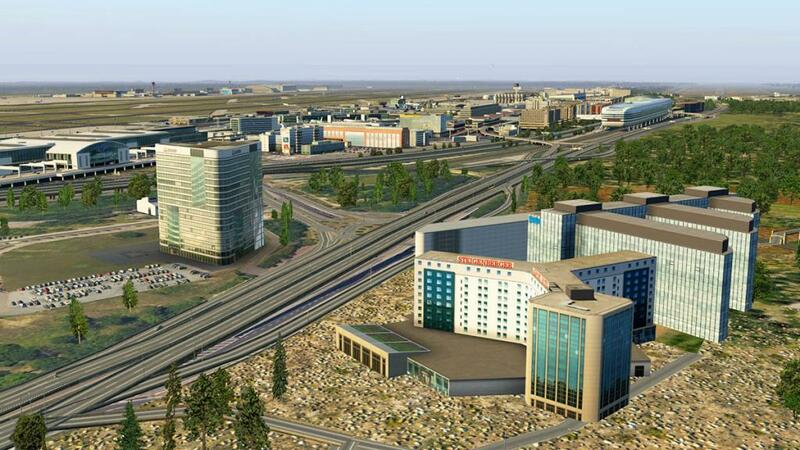 The object count is extreme and to the limit, but there is a slight little bit of cheating going on in here as a lot of the buildings are really only quite basic and their textures are so good you don't really notice the square or oblong flat building holding them.... it is clever and never ever really looks that way in the scenery. 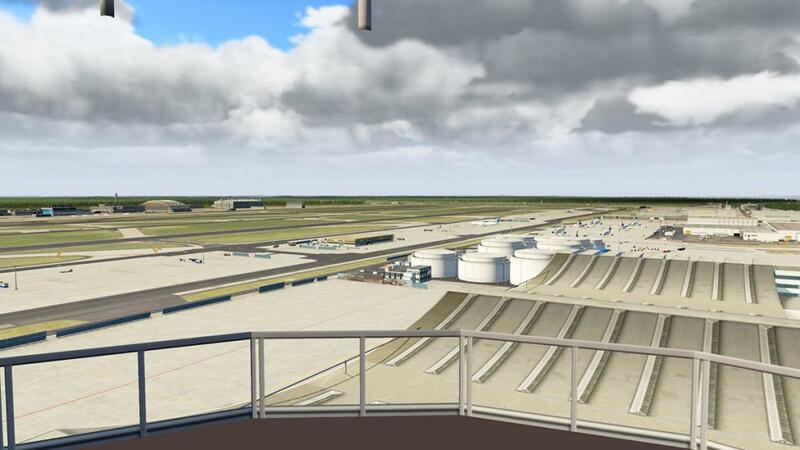 But where it counts in the design of the terminals and the major significant buildings they are well designed and produced. 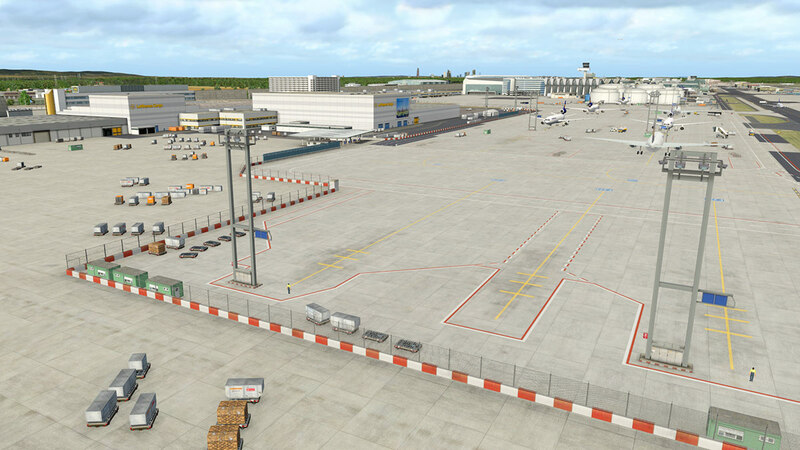 Airside the Terminal layout looks quite confusing? 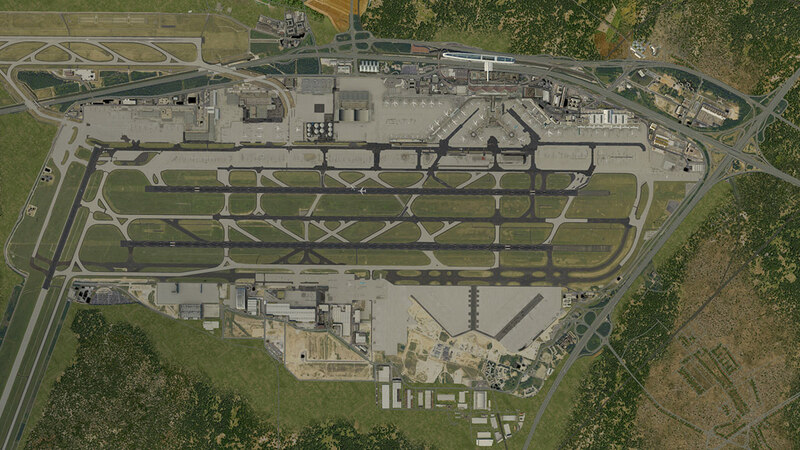 But study the design from above and you can work it out. 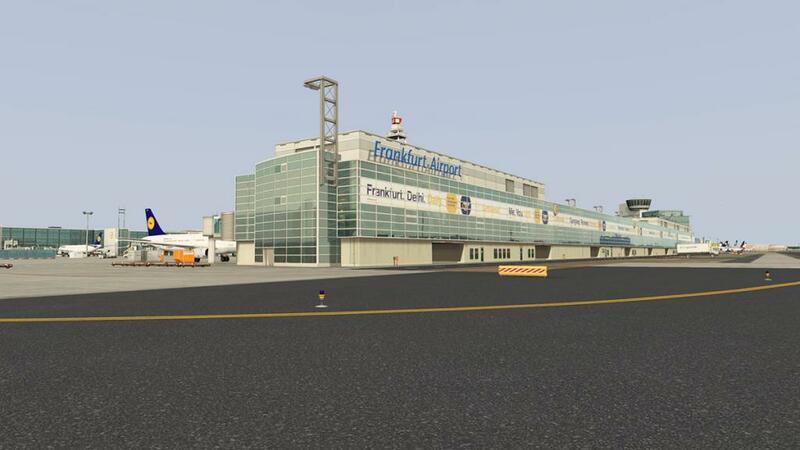 Frankfurt - FRA has two main terminals in Terminal 1 and Terminal 2. 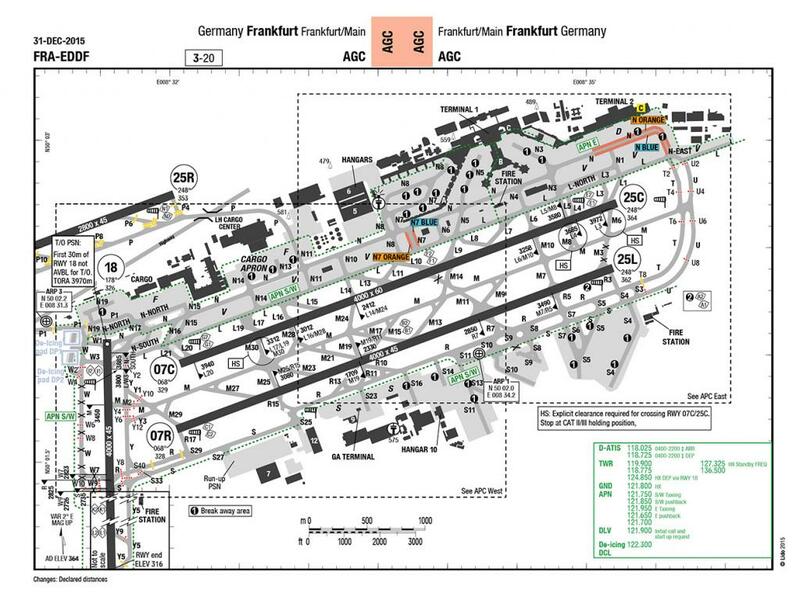 Obviously T1 is the original FRA terminal and to a point the original terminal is still there but now buried by decades of extensions. 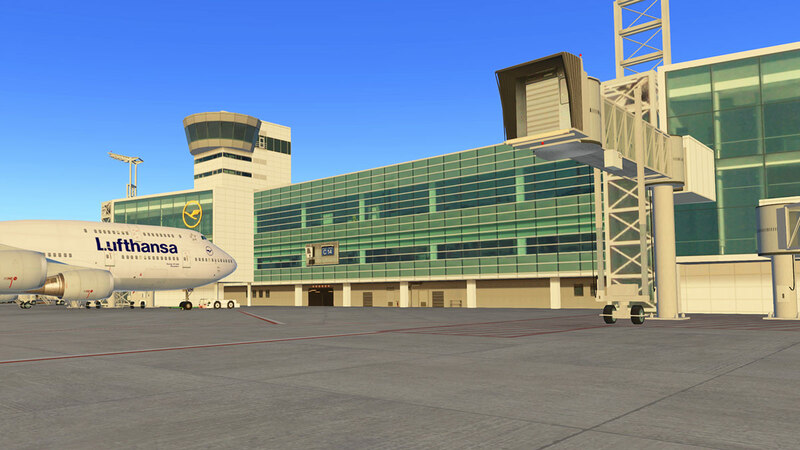 More to that fact is that the oldest part of the first terminal in Concourse B has just been completely renovated and Concourse A has been extended for A380 operations and is called A-Plus. 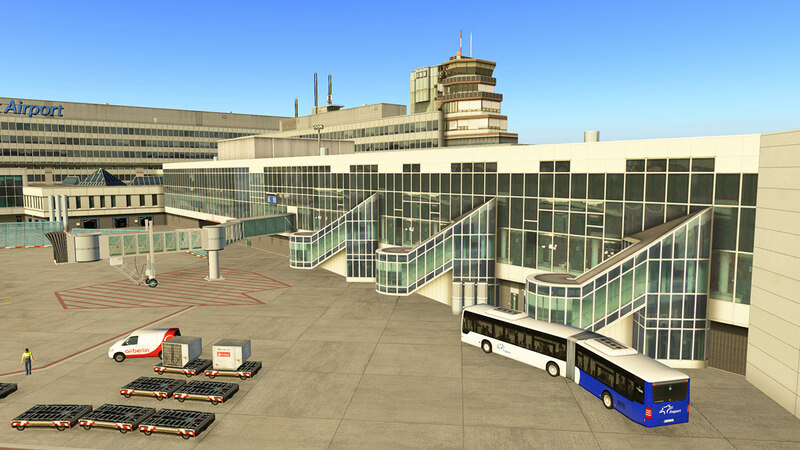 Terminal Mitte (Central Terminal, today known as Terminal 1) was originally divided into three concourses (A, B and C) with 56 gates and an electric baggage handling system. 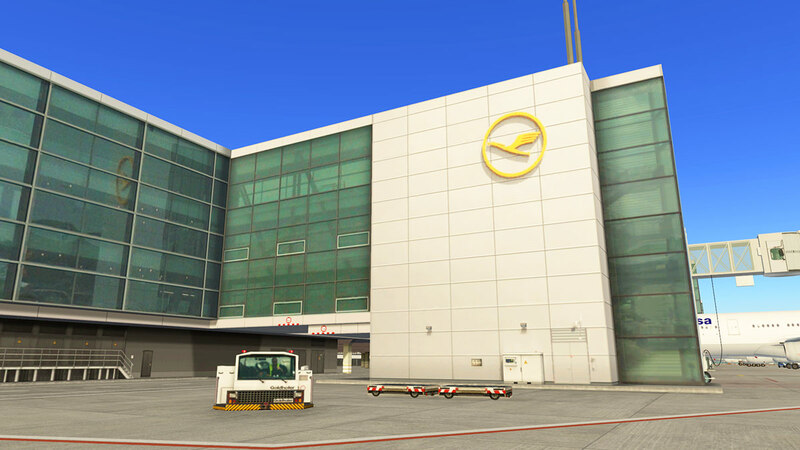 It was first opened to the public on 14 March 1972. Since the 1970's it has spurred off concourses and gates. 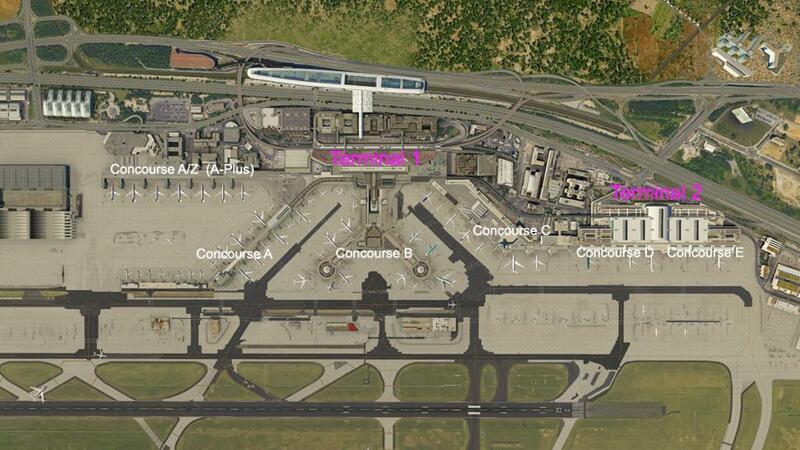 The layout now is Concourse A and AZ, Concourse B and Concourse C. Concourse B is now the old Central Terminal reconfigured (above) and Concourse A and AZ (below) is to the west and Concourse C to the east. 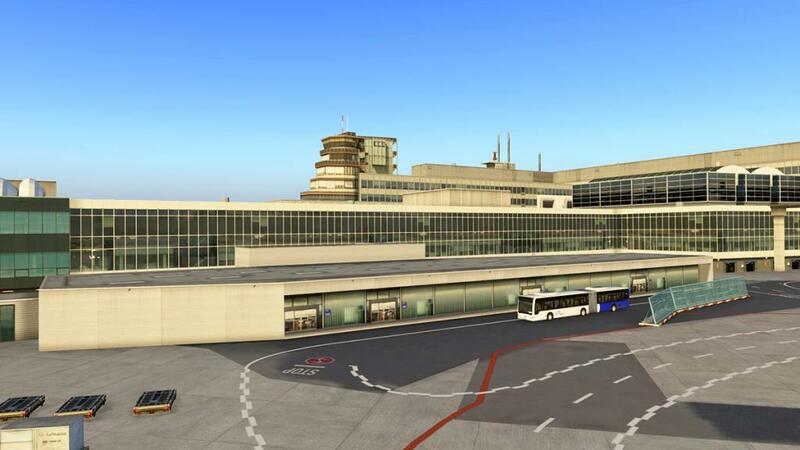 Gate numbering is not sequential and there are 25 gates in Concourse A/Z, 18 gates in Concourse B and 11 gates in Concourse C.
The new A-Plus (Z) concourse (below) can park category F A380's with gates A54, A58, A62 and A66 with double deck boarding gates. ... and again attention to detail is extraordinary good. 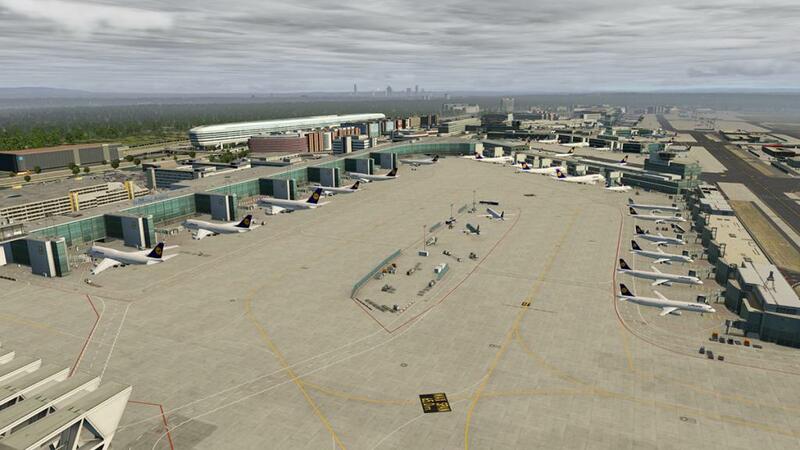 Concourse B is very well modeled in blending in the past with the newer elements. 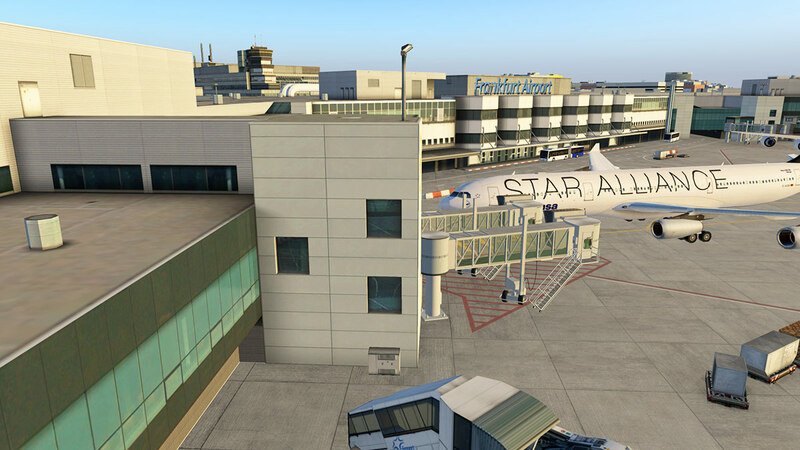 Great detail in passenger moving coupling buses as every area is very well populated with ground and ramp equipment, that is very well placed to add in the correct volume of visual equipment without obstructing you when arriving and departing the gate. So if you want a different contrast of a EDDF arrival than the overwhelming mostly glassy modern Germanic architecture then Gates C 1 - C11 will give you more of the original FRA feel, just like the few pockets left of older gates at Heathrow. 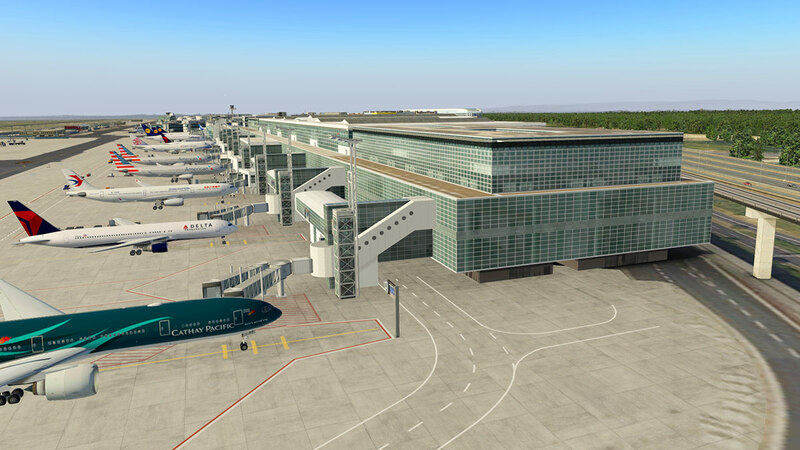 The contrast between the eras has been well developed here and the newer terminal glass looks so good it is translucent. 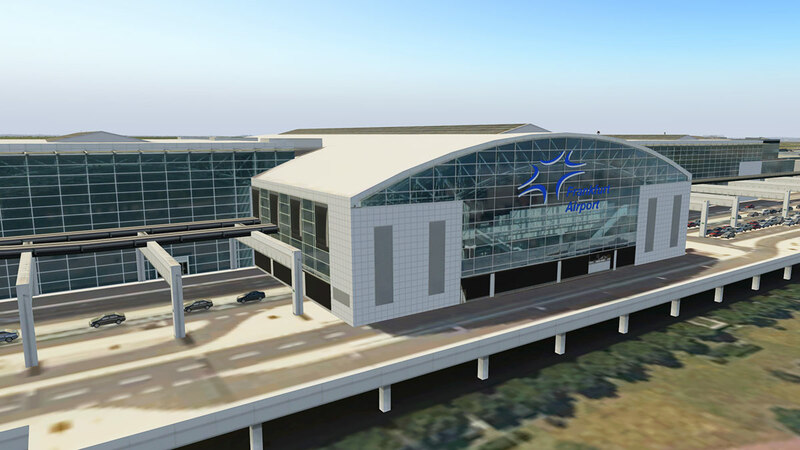 Terminal 2, which has a capacity of 15 million passengers a year, was opened in 1994 and is divided into concourses D and E. It is a continuous concourse between the main Terminal 1C and 2D provides direct, but non-public access between the two terminals. 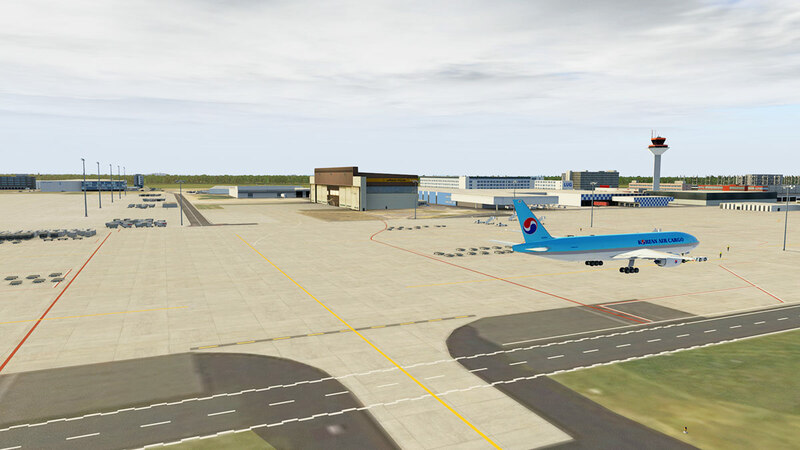 It has eight gates with jetways and 34 apron stands for a total of 42 gates. The glass construction of T2 is different from the rest of FRA's terminals, but still very green glassy in design. 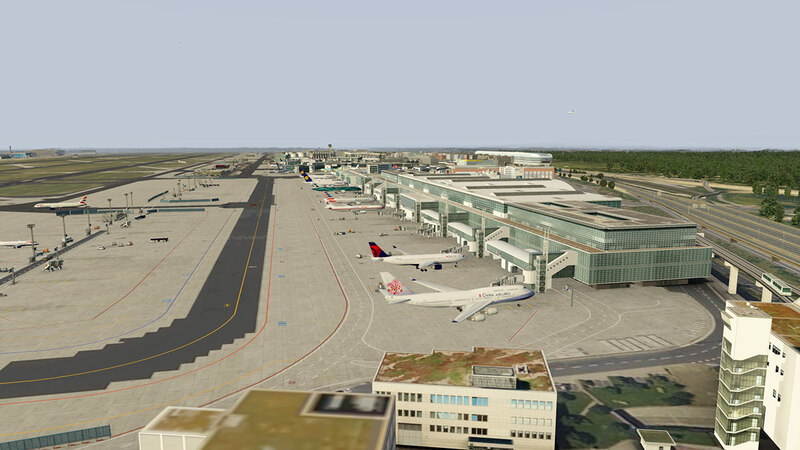 This is the terminal for the oneworld team of American Airlines, British Airways, Cathay Pacific, Finnair, Iberia, Japan Airlines, LAN Airlines, Malaysia Airlines, Royal Jordanian and S7 Airlines and SkyTeam alliances of Aeroflot, Air France, Alitalia, China Airlines, China Eastern Airlines, Czech Airlines, Delta Air Lines, KLM Royal Dutch Airlines, Korean Air, Saudia, TAROM and Vietnam Airlines with gates E2 and E5 as category F.
All gates have the animated boarding bridges with Safedock A-VDGSs and marshallers on stands, but which ones work and which ones are the eligible gates/stands is not easy to find out as there is so many to check around, the few gates I used were animated and did work well in A24 and B27. 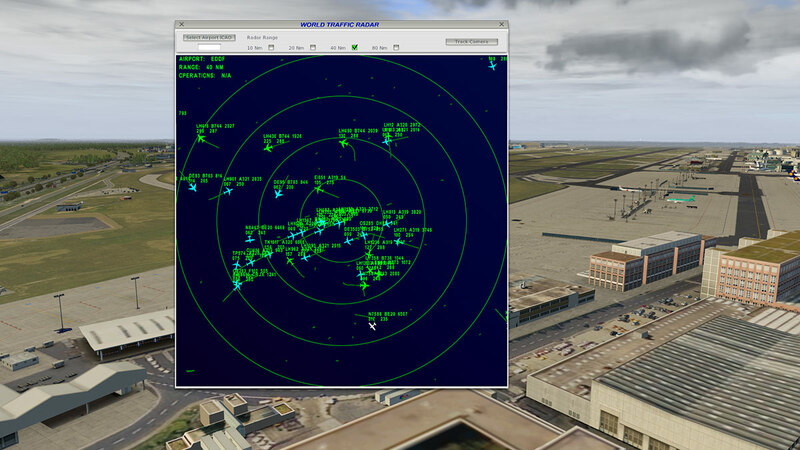 There is huge amount of animated traffic as well as this EDDF is a busy place. 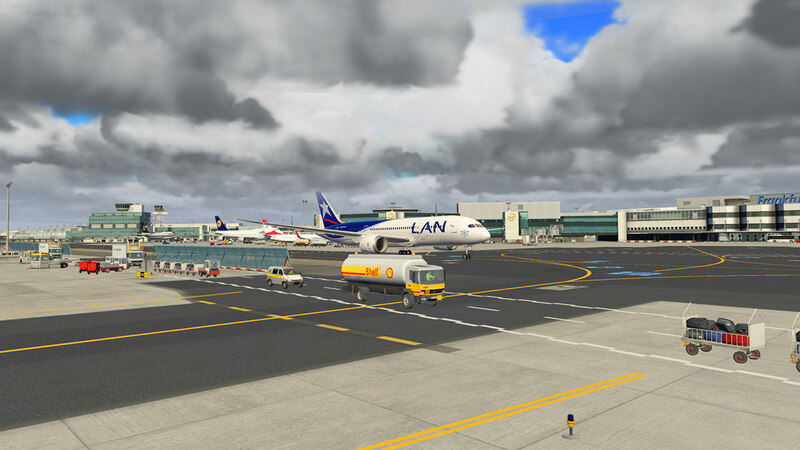 The traffic tends to queue up a lot, mostly at intersections and parked aircraft, but that just adds into the dynamics of the airport. 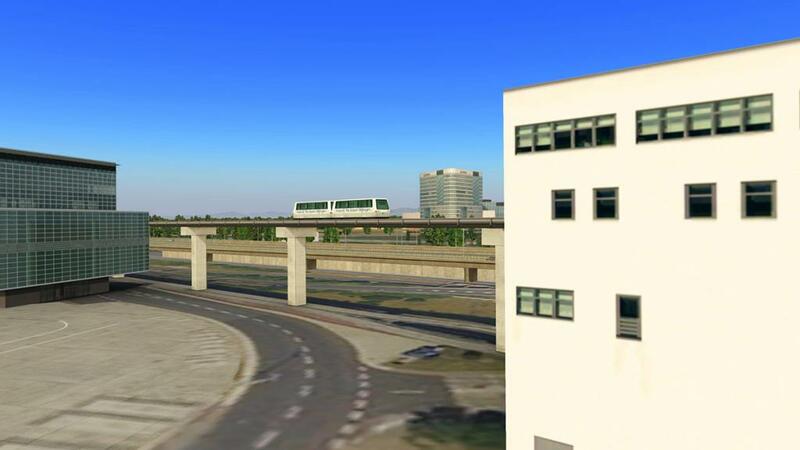 The Fraport railcars that connects to all the terminals are in there, but not animated. Lufthansa'a engineering arm Lufthansa Technik has a very large presence at EDDF. 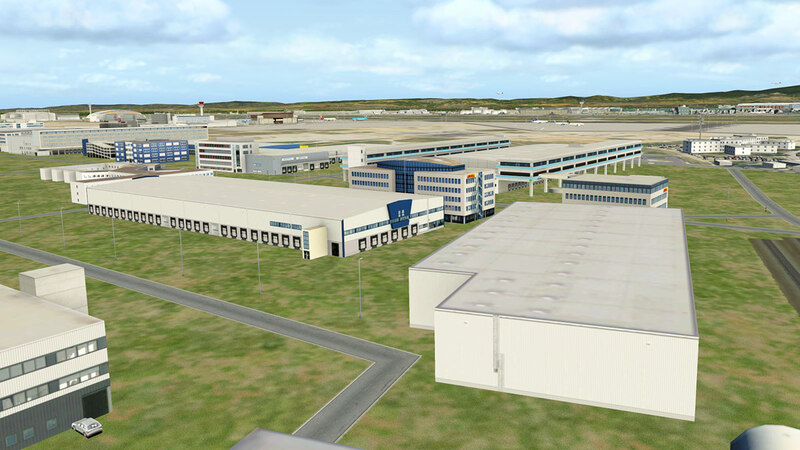 It is set out in two areas with one central north and another larger facility on the south side of the airport (built for the airlines A380's). 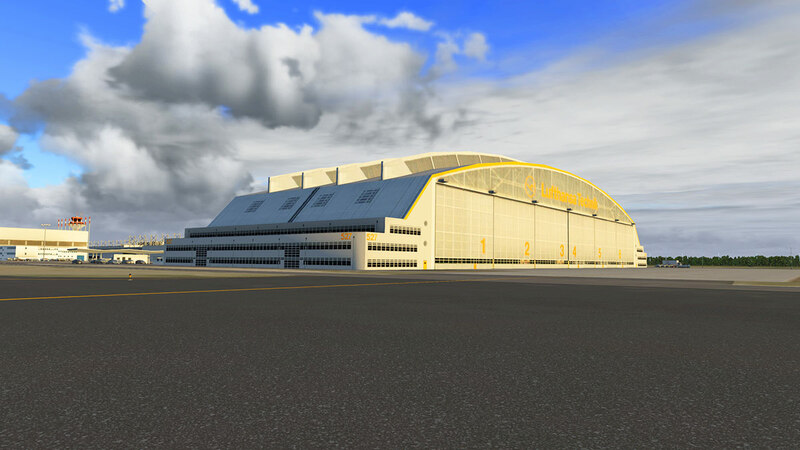 In the central north there is a very iconic and distinctive maintenance hangar. 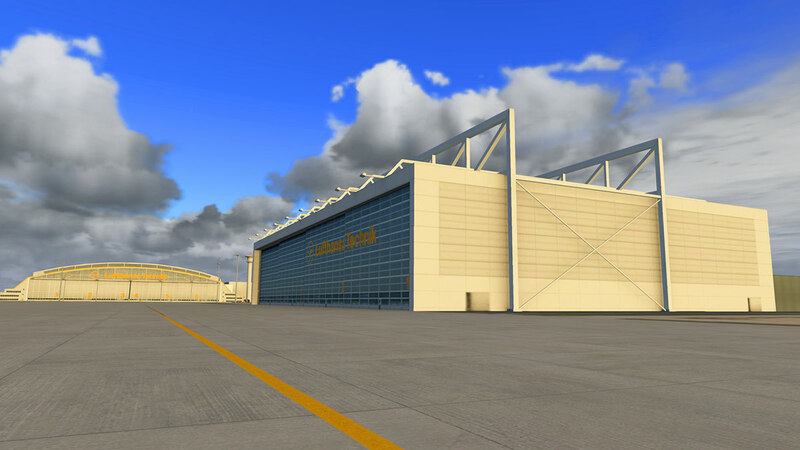 The buildings construction is excellent with perfect realistic textures, certainly with the concrete roof supports, there is a secondary large maintenance building behind the hangar. 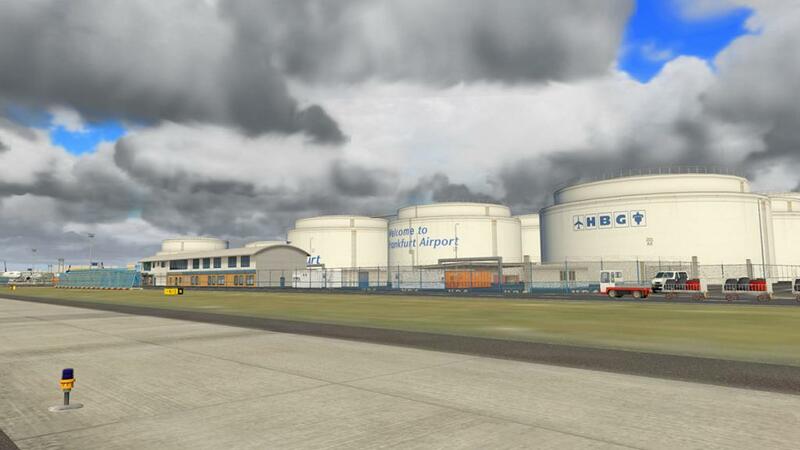 Next to the Technik hangar is the airports fuel depot. Not just the actual tanks, but great detailing around them with buildings, pipes, fencing and vehicles... this type of detailing is highly evident right though out this scenery, there so much visual detail that is present and certainly far too much to cover in any detail here in this review, but for noted eye candy you have almost everything you need to fill out all your senses here. 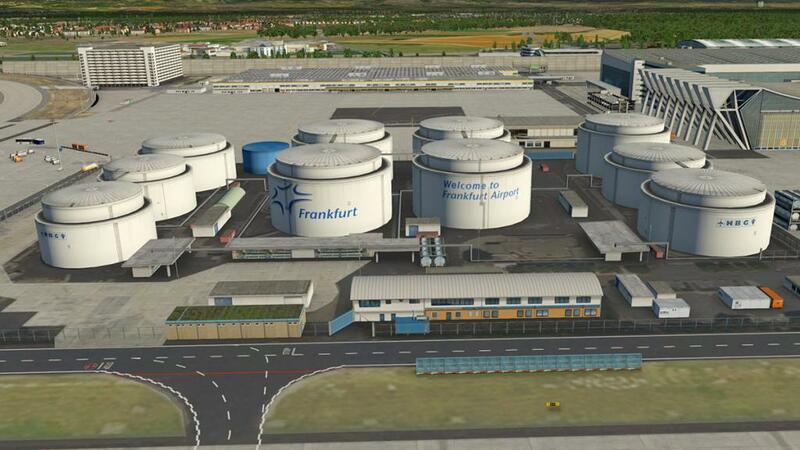 Frankfurt is the second largest cargo hub in Europe after Charles De Gaulle in Paris and the huge facility here is split into two areas with in the north (CargoCity Nord) and in the south (CargoCity Süd). 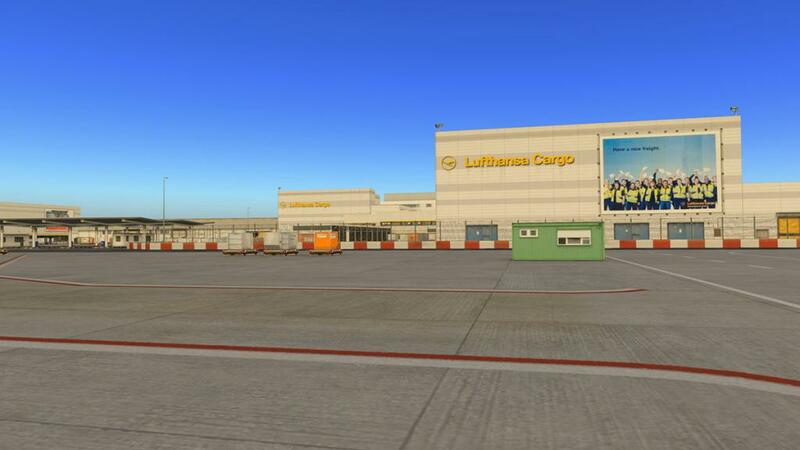 CargoCity Nord is all Lufthansa and is basically two separate ramp areas and is the Lufthansa Cargo headquarters. 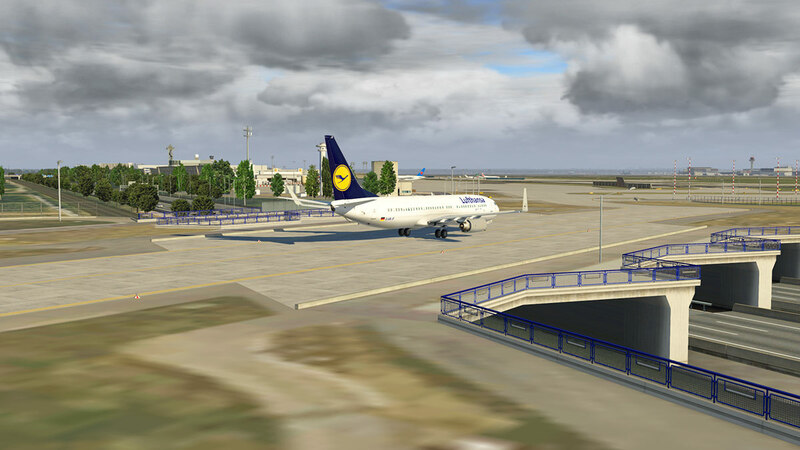 For the haulers out there then this is the place to work from, it is about as good as it gets and this is the departure point for the interesting Lufthansa Cargo route to Yemelyanovo Airport in Russia. 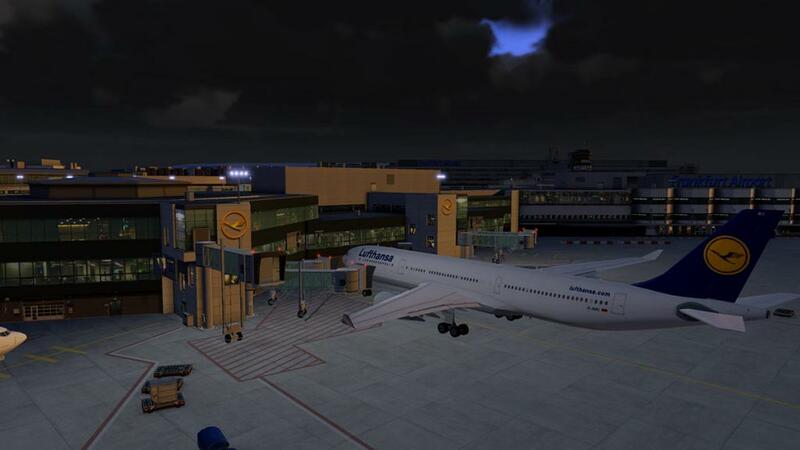 So why fly an MD11F to a freezing cold Russian airport in the absolutely middle of nowhere? 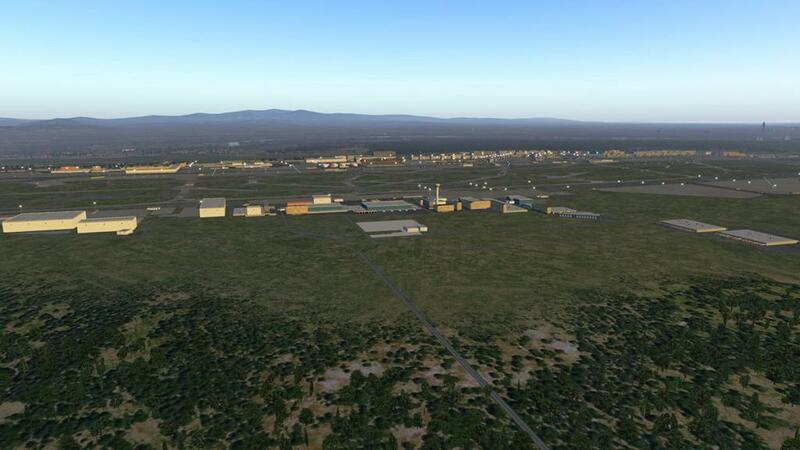 To get Russian overflight clearance, that is why. 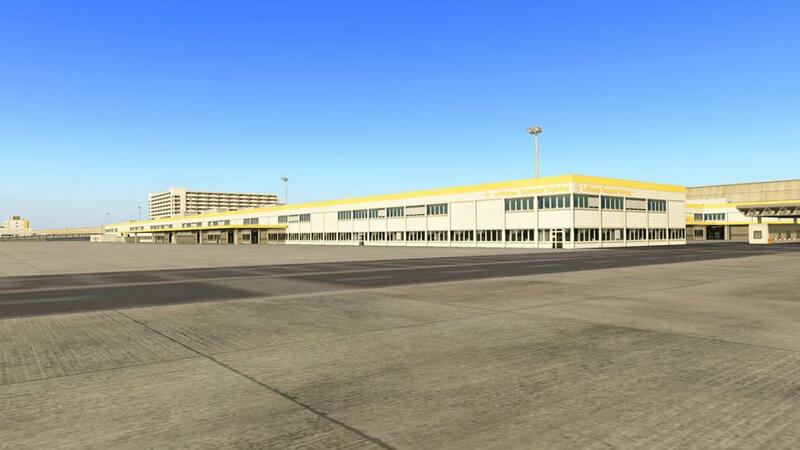 Overall the FRA Nord Cargo area is one of the best in X-Plane with great detail and markings and all the buildings and cargo storage areas are first rate. 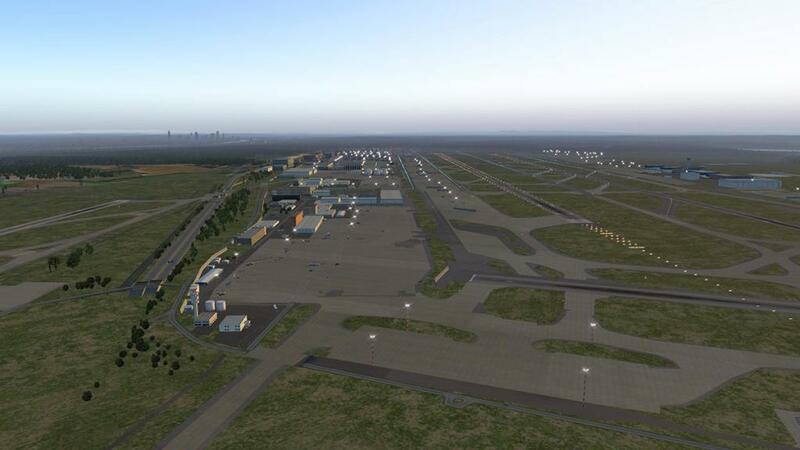 Far west CargoCity Nord is a multipurpose cargo area with a big FedEx complex, and some small hauler/carrier offices. 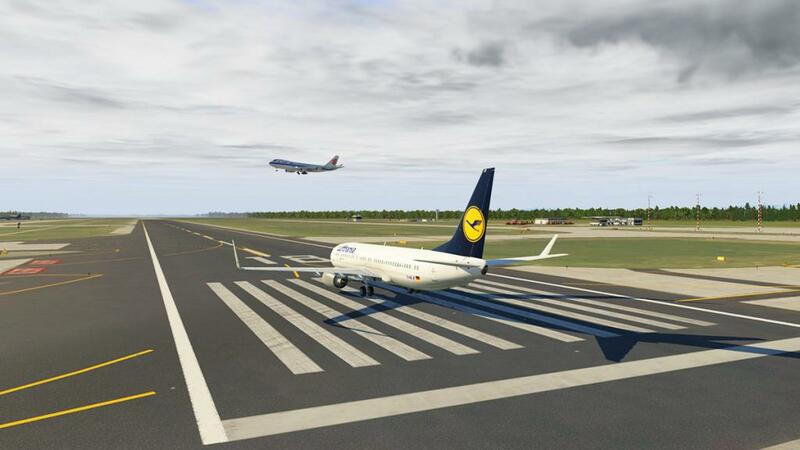 A note is important here. 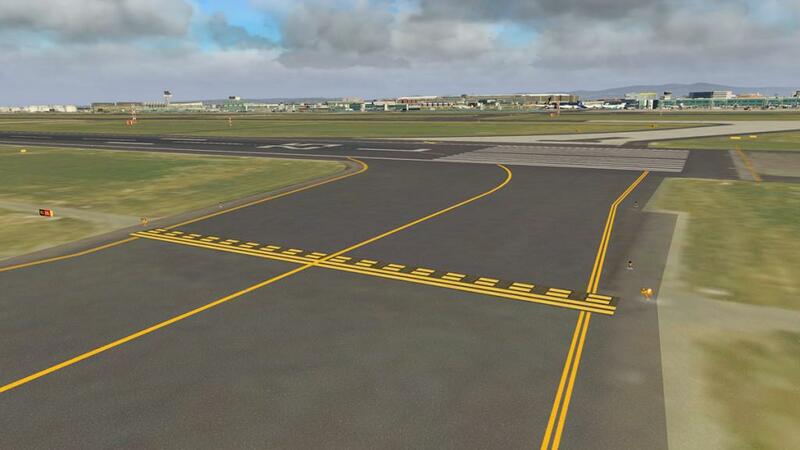 The main taxiway to "Runway Northwest" 07L/25R cuts through Cargo Nord at intersection N11 to taxiways F then P. This taxiway is so, so easy to miss but then get ready to turn right just past the fuel depot. 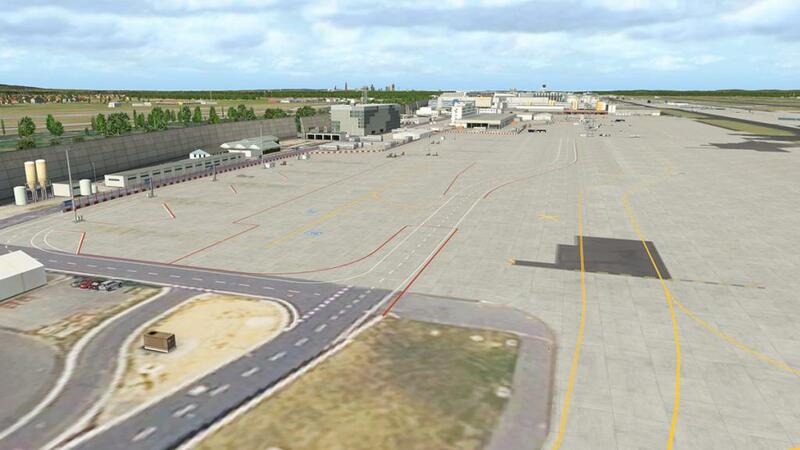 The Lufthansa Technical Training building (above right) is off this taxiway P as well. 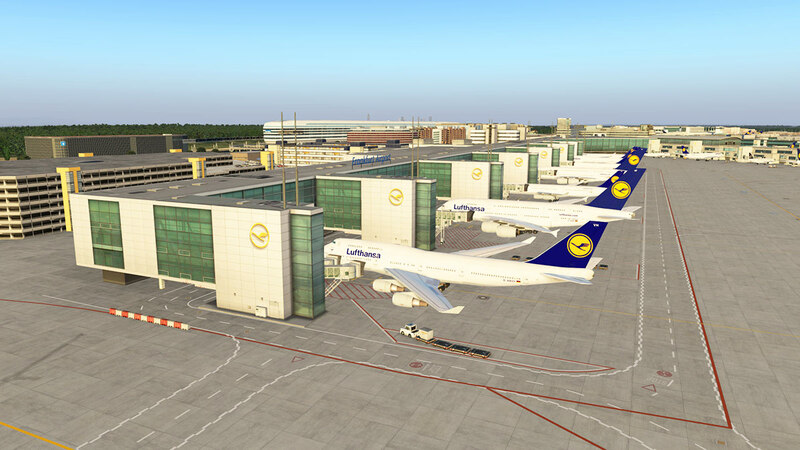 Frankfurt's main Control Tower is position central by the A gates and Lufthansa Technik hangar. 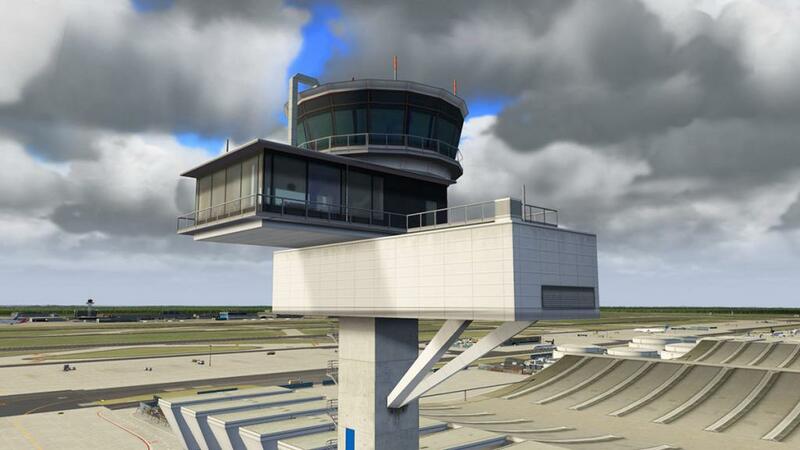 Modeling of the tower is absolutely first rate, with great detail and excellent glasswork. Finer details include railings, air-conditioners and stairs. 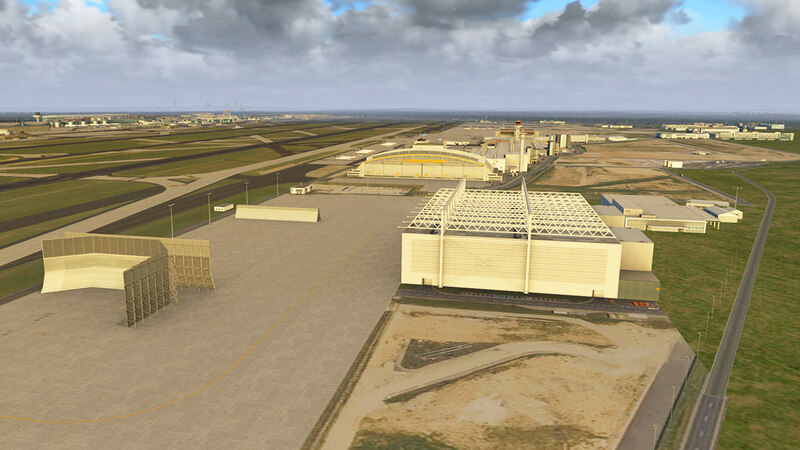 Field view is obstructed by the tower elements, but not in a poor way as all the approaches can still be seen clearly. 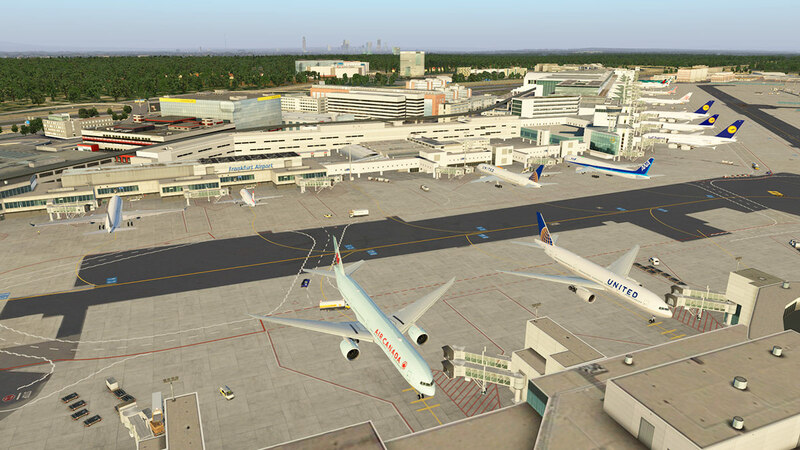 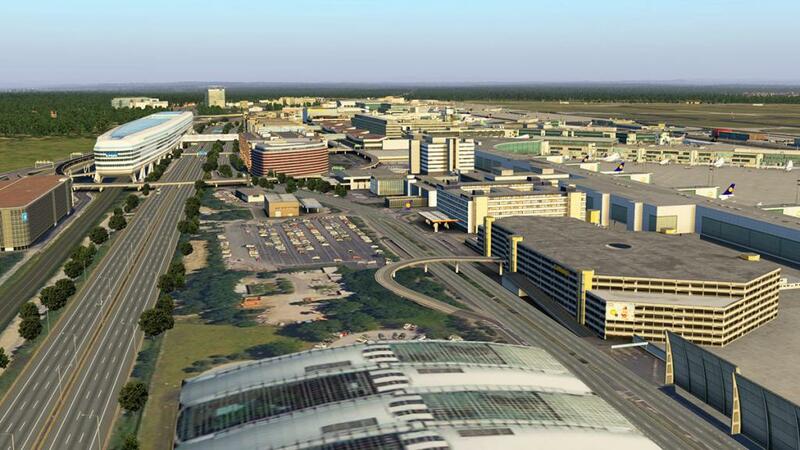 The original Aerosoft Frankfurt scenery (the free one) did have a lot of landside buildings, but they were more generic than attributed to the actual airport skyline. To many the inclusion of these buildings are not the primary aspect of the airport, but to a point they are as important as the actual representations of terminals and airport logistics, in many ways these landside skylines represent the airport as a whole... the wide view so to speak, so if they work well then so does the whole scenery and that aspect is certainly crucial here at FRA. 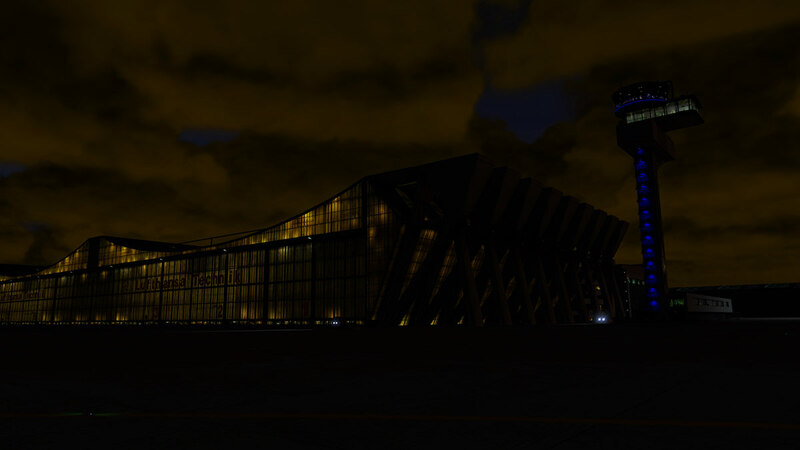 You are not disappointed here in that aspect either. 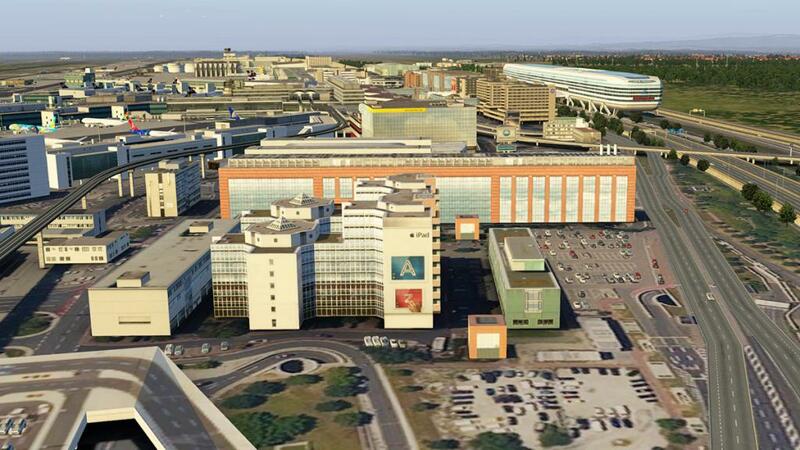 Every significant building or complex has been covered, even the more outer perimeter flat/hi-rise towers are represented. 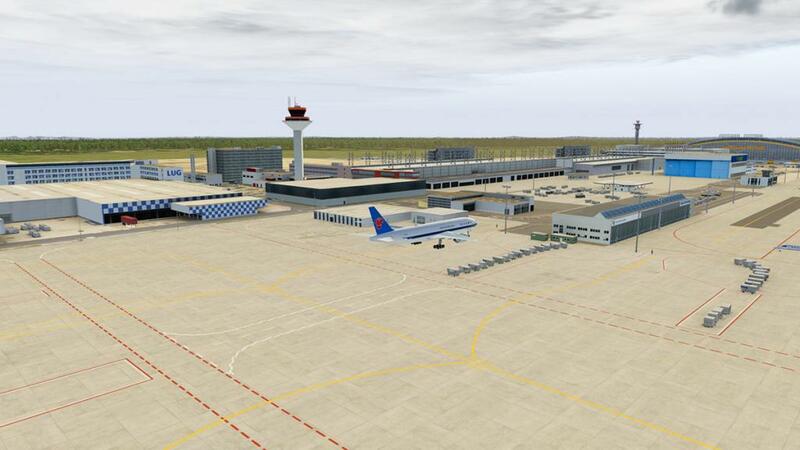 The list of course is huge, from Sheraton Hotels to airport administration buildings they are all here and fully modeled for your enjoyment... but there has to be a catch? Well there is... you can't have a huge object count and not feel it on your framerate, so there has to be a compromise. 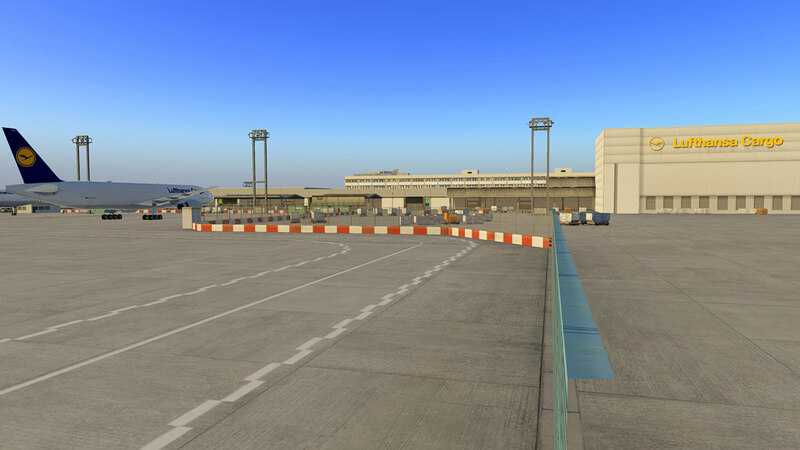 For smaller mid-sized airports you can do that high object detailing and even down to say park benches or wastebins. But you can't do that in a scenery this large and expansive. 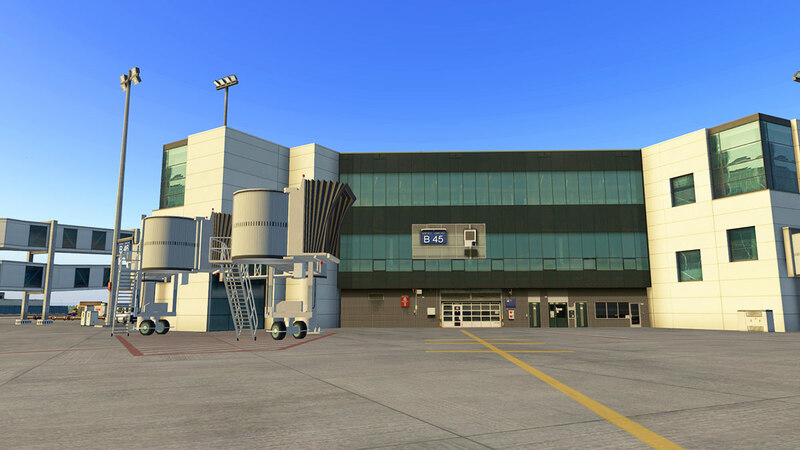 Aerosoft's basic textures are very light or a lower resolution than anything else, their argument would be that you really don't see them anyway with the building placement. 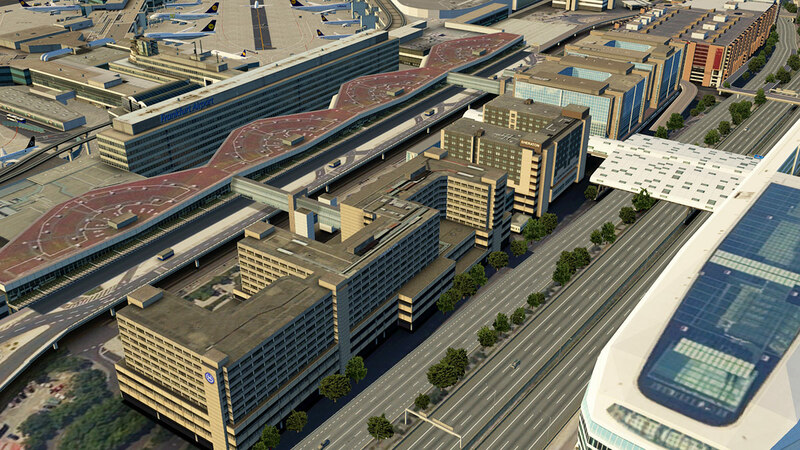 So the ground textures are mostly low-res and it shows and the ground fill (cars, buses) is light as well, and as noted many of the buildings are quite basic modeling wise, but the good quality textures surrounding them hide that fact. 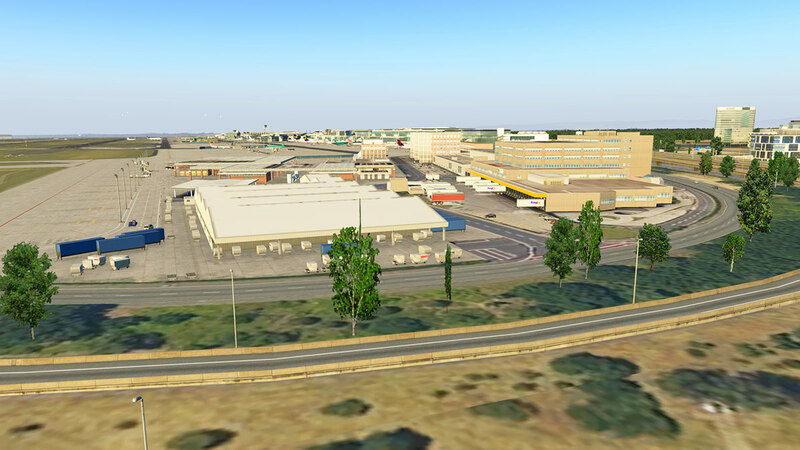 The important aspects are however in there. 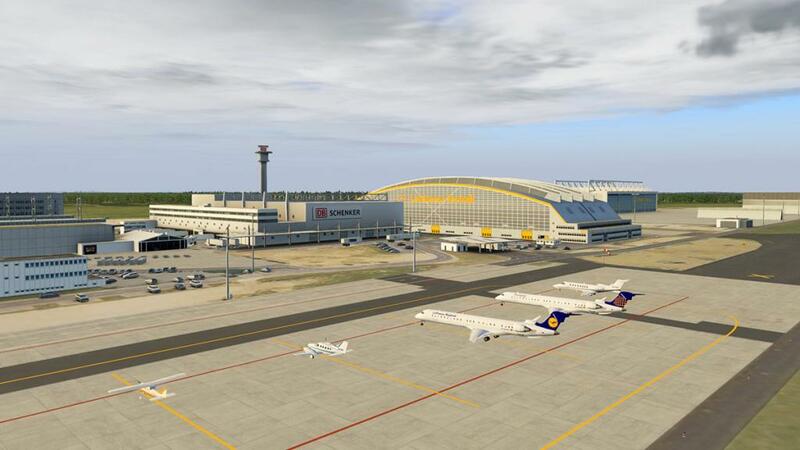 Like the First Class Reception centre of which most of us earthly beings will never see inside of... and the great modeling of the huge Sheraton Hotel/Frankfurt Airport Centre complex. 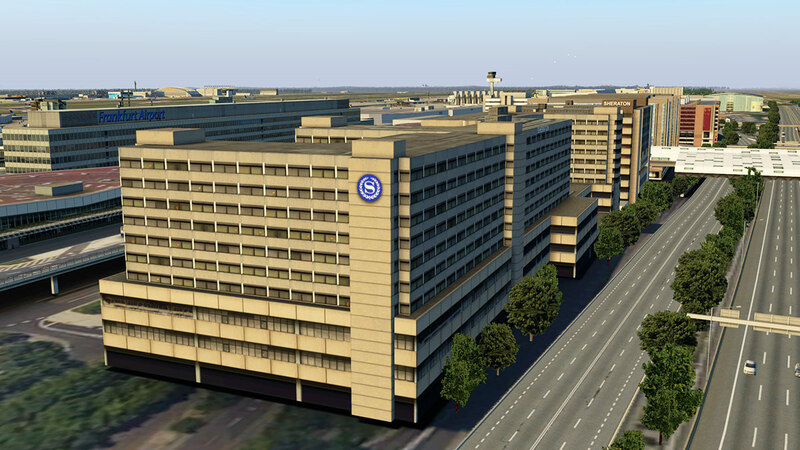 The most significant building is of course is the 2011 large office building called "The Squaire" (a portmanteau of square and air). 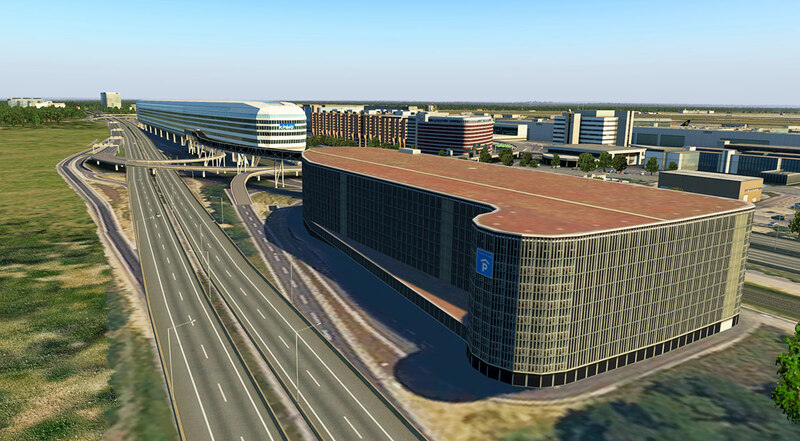 It was built on top of the Airport long-distance station and is considered the largest office building in Germany with 140,000 m2 (1,500,000 sq ft) floor area. 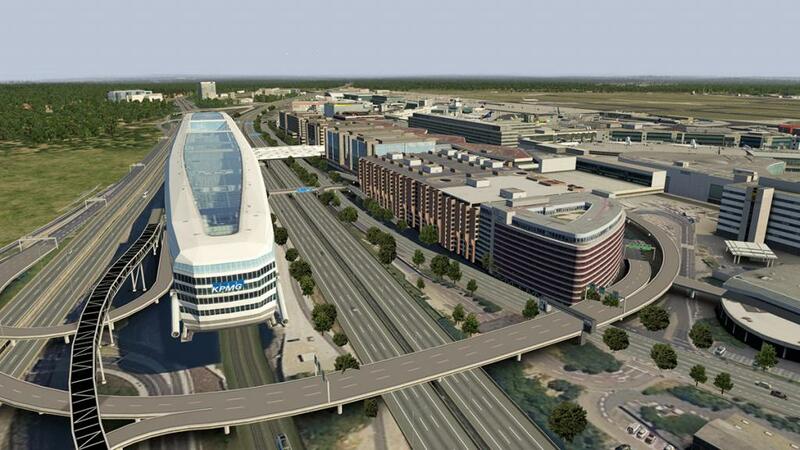 The main tenants are KPMG and the two Hilton Hotels. 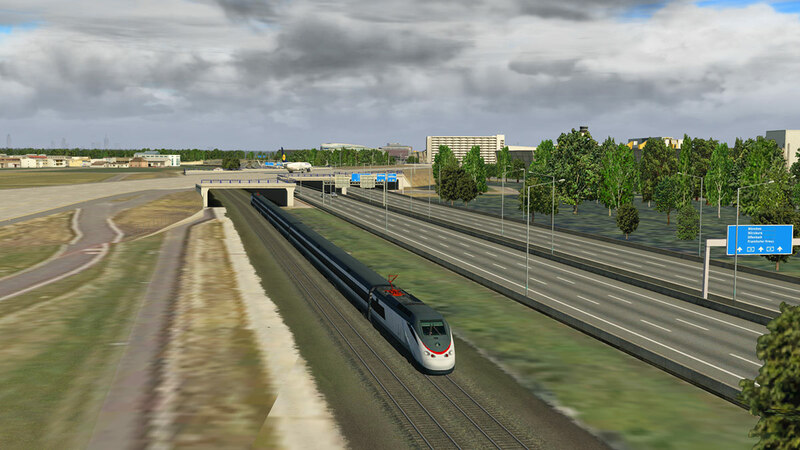 And like were it counts with the Squaire, the modeling is absolutely first rate (the glass work is exceptional), and the active traffic (and trains) works well here as part of the scenery that flows under the building. 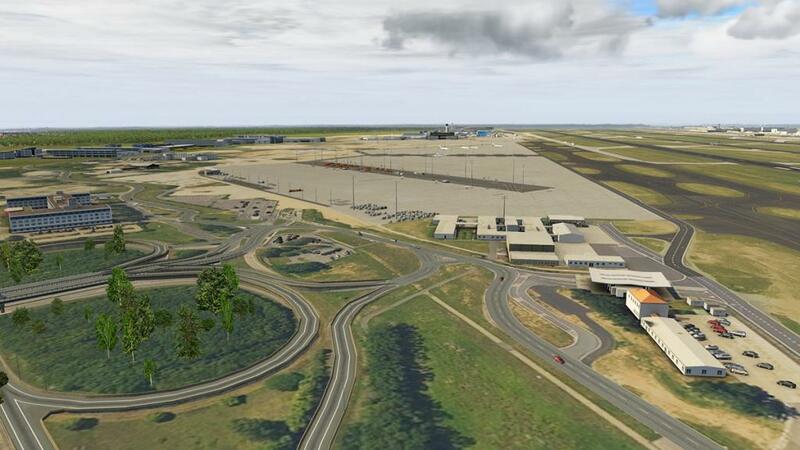 The traffic system is used to great effect also in the far east section of FRA, it is perfectly intergrated and visually very good. 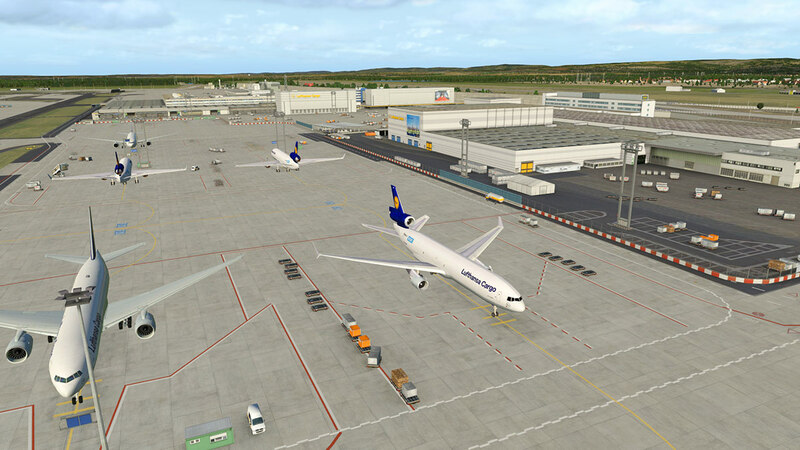 LH Sky Chef's Catering and another small cargo hub is positioned here in the east as well. 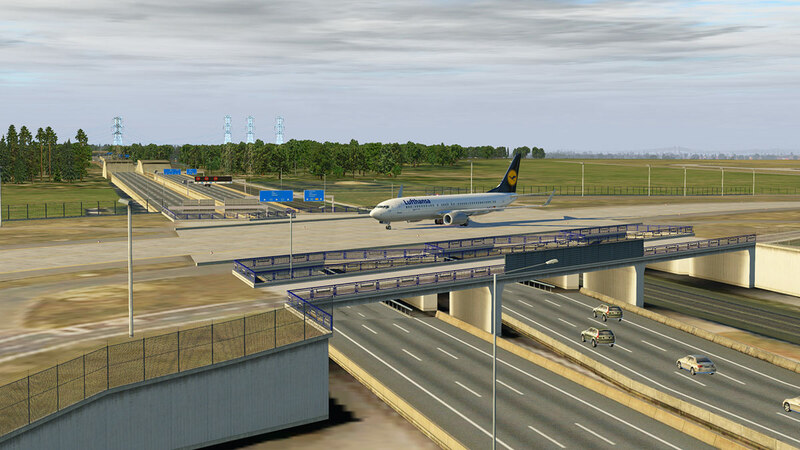 A great addition to the scenery is the Commerzbank-Arena that is situated far east of EDDF, but is significant visually for all eastern approaches. 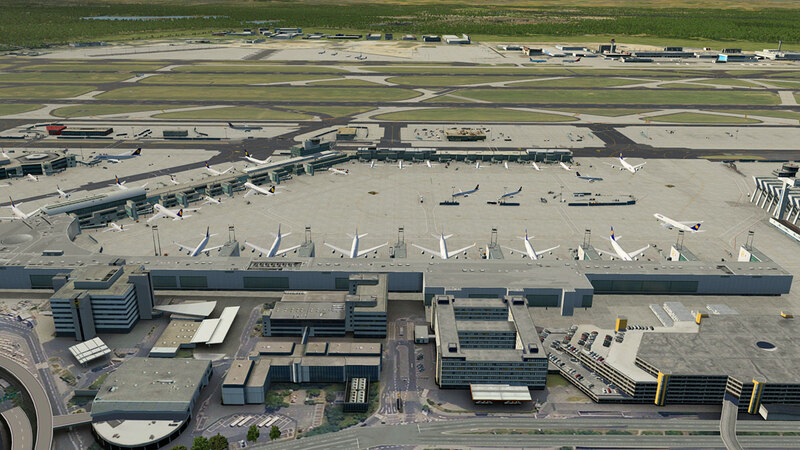 The south section of Frankfurt Airport was up until recently the Rhein-Main Air Base. 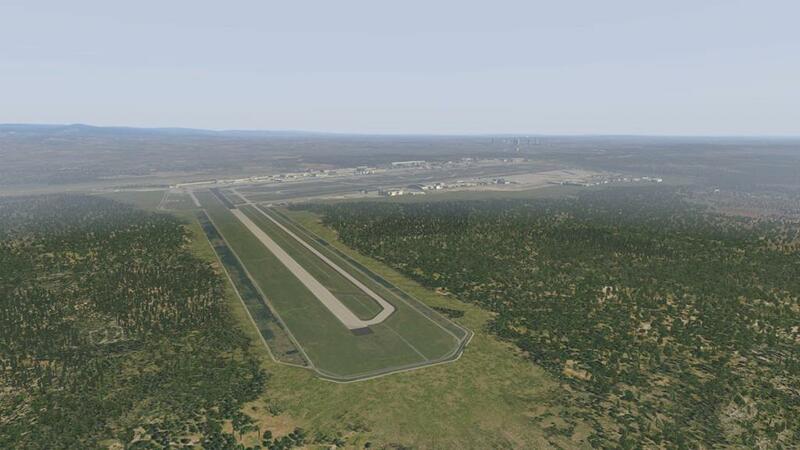 It was closed on the 30 December 2005, as the US Air Force moved then to Ramstein Air Base. 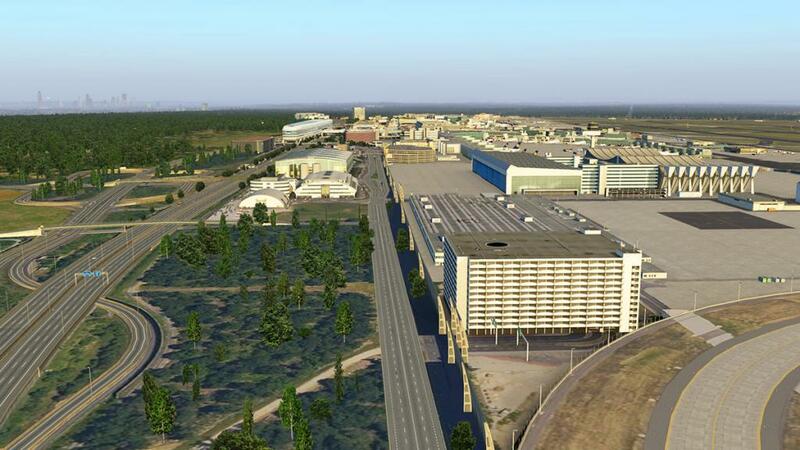 This area's history actually goes back even further as it was originally part of a base used as a field for fixed-wing aircraft and in the extreme southern part near Zeppelinheim it served as a base for the Zeppelin rigid airships. 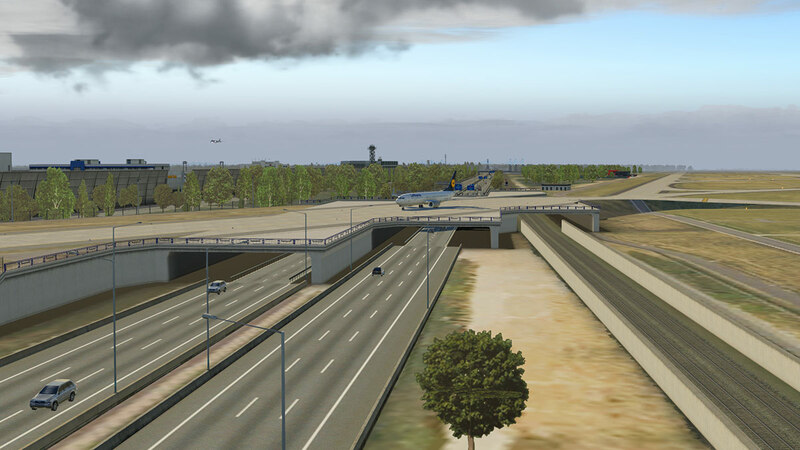 This section of Rhein-Main later became the base for the Graf Zeppelin, its sister ship LZ-130, and until 6 May 1937 for the ill-fated Hindenburg. 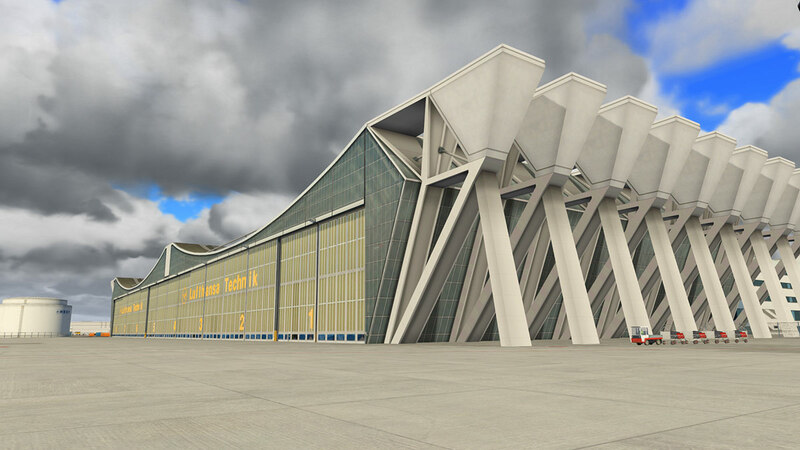 The airships were later dismantled and their huge hangars demolished on 6 May 1940 during the conversion of the base to military use. 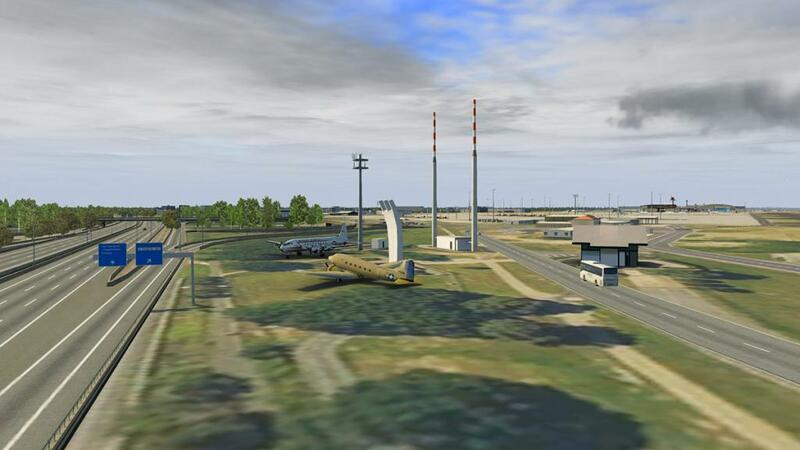 Most of the airbase has now gone, but a few remnants remain like the Dakota C47 and C-54 Skymaster by the Berlin Airlift Memorial and old gatehouse. 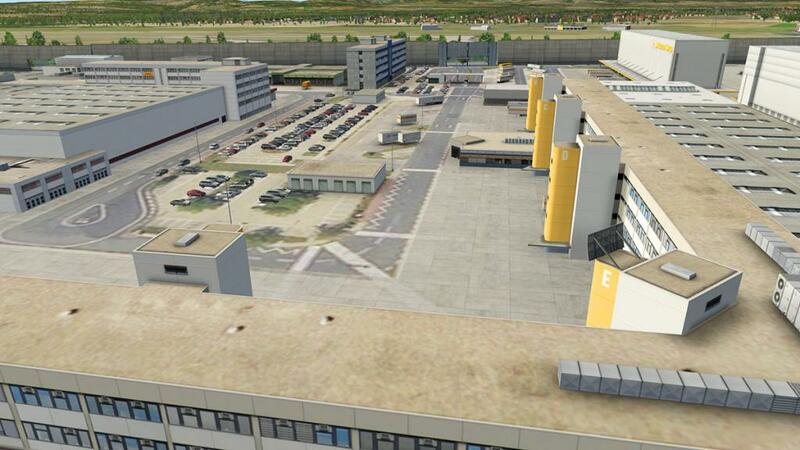 A lot of the old expansive airforce base ramp space is good for aircraft storage, but the area is earmarked for Frankfurt's new Terminal 3 complex. 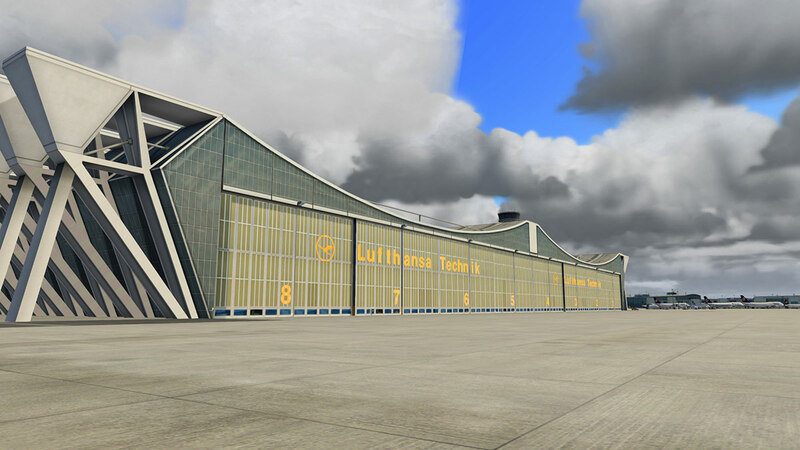 The new A380 Lufthansa Technik maintenance hangar is impressive, massive, but the detailing on the other Lufthansa Technik hangar is also excellent. 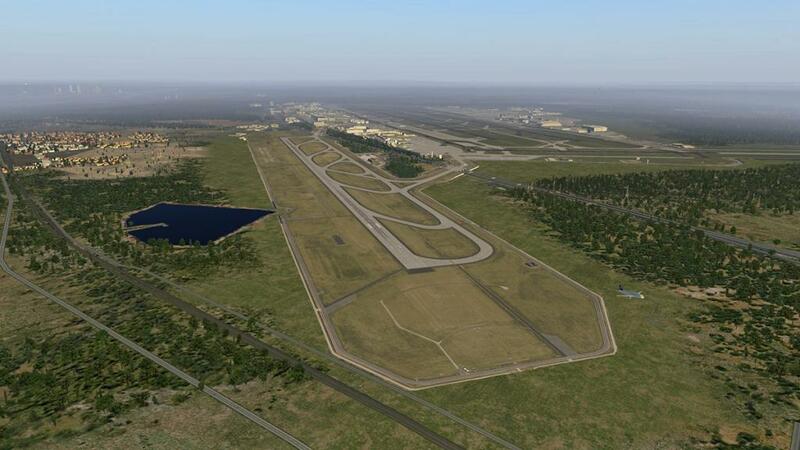 There is an engine test blast fence here as well. 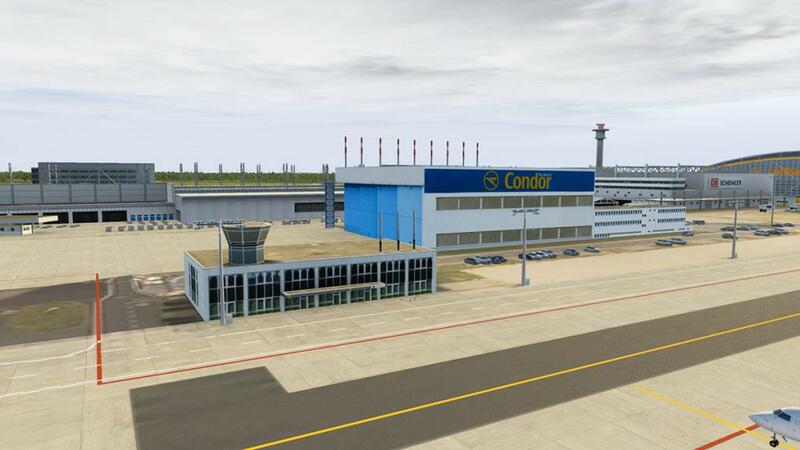 Most of the southern area is part maintenance for Condor and Lufthansa Cityline and part CargoCity Süd (South). 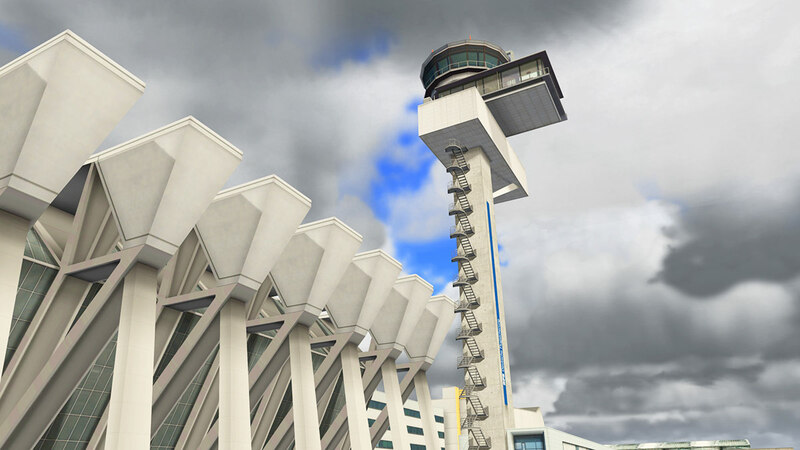 All south side buildings are covered and the old military tower is now the south ramp tower, it is really another airport on its own without the huge complex the other side of the runways... 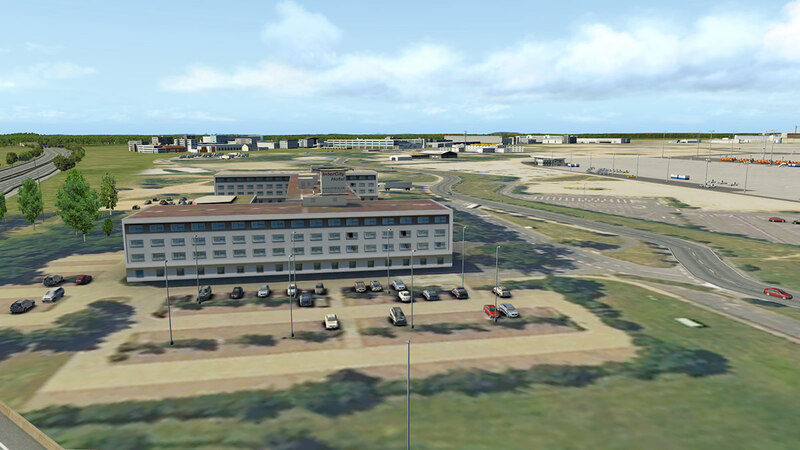 The old airbase headquarters is now a hotel, and south, south there are factories just placed on the ground, but with no real detail as their only purpose is to fill out the area. 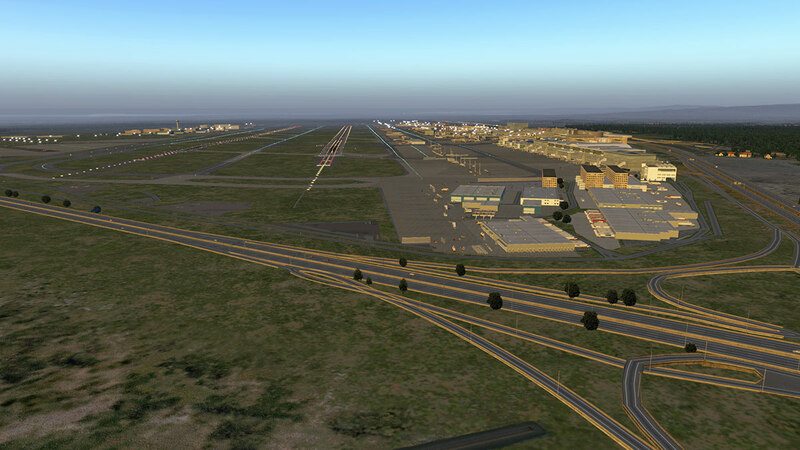 The main active runways are the two parallel runways of 07R/25L - 07C/25C. 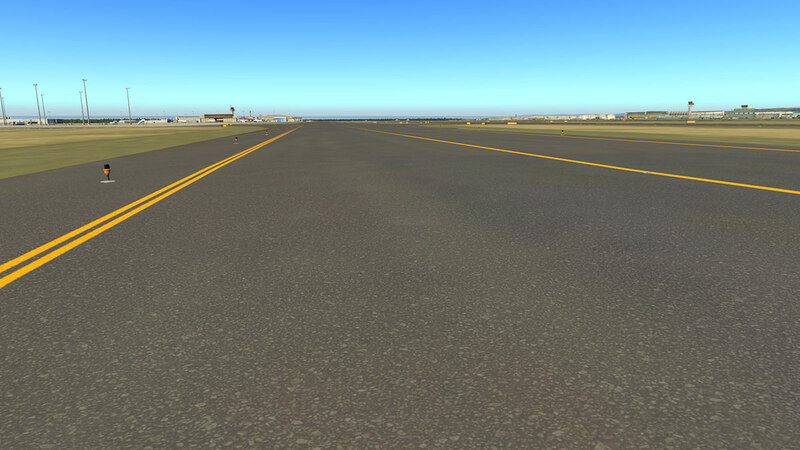 Runway and taxiway textures are first rate if not perfect. Lineage and signage is as expected very good, but it very easy to get lost out here, so study your ground chart. 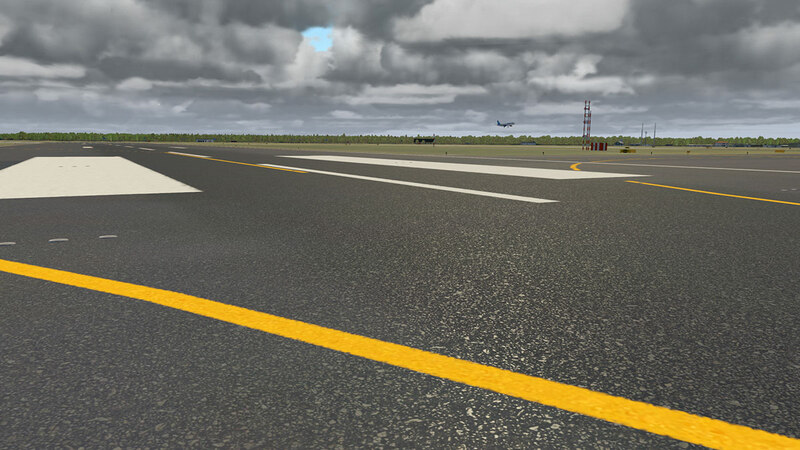 In the right lighting conditions the ground reflections are very good and shows you the great and almost realistic 3d asphalt textures. note the worn to lighter parts of the asphalt... lovely. There is however no famous Aerosoft 3d grass, and it is highly noticeable with the wide flat grass field areas. 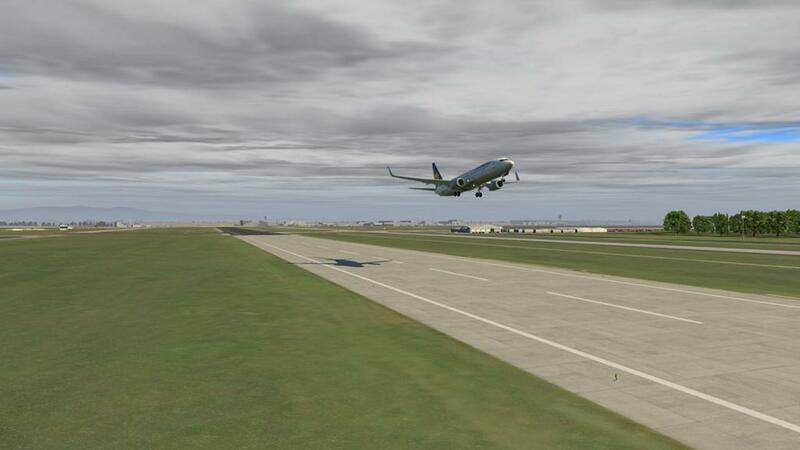 My guess it was the framerate hit that succumbed us to the loss... but I think we still could have had the choice. 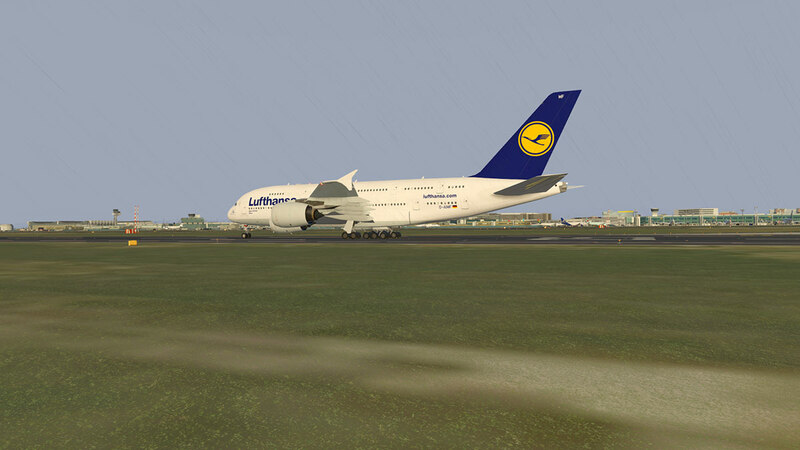 The controversial new 07L/25R is great as well. 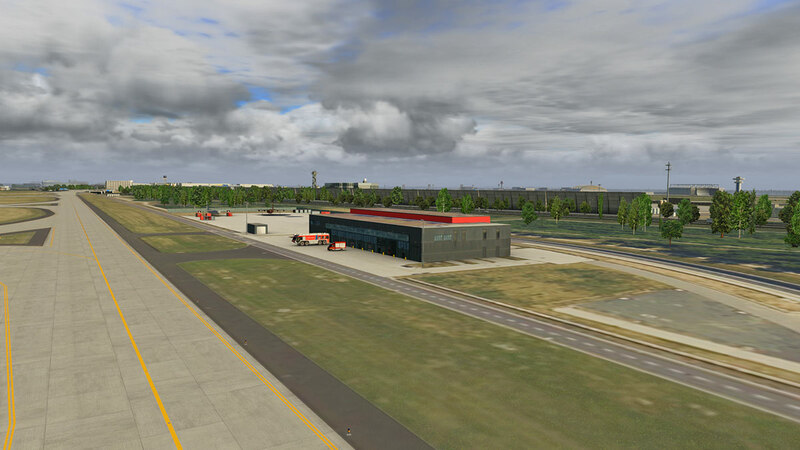 This runway is used only for arrivals and there is a great Fire Station located on taxiway P.
... and the other overpass is on taxiway P1 far west of the cargo area. 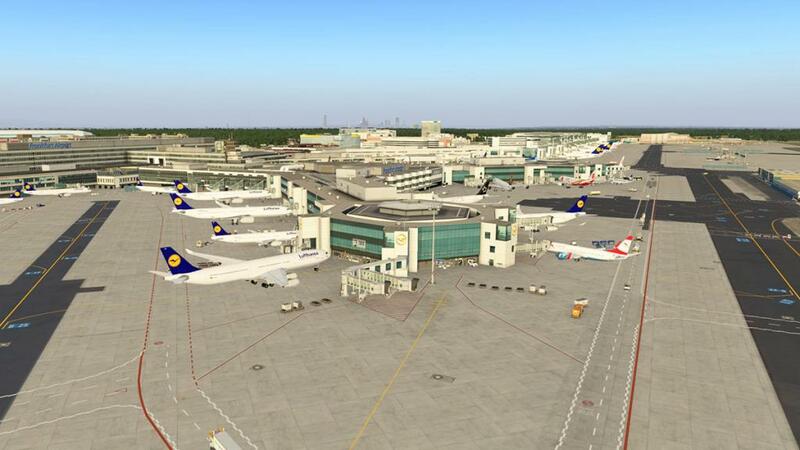 Aerosoft's EDDF - Frankfurt is fully compatible with all A.I., X-Life and WorldTraffic3 activity. 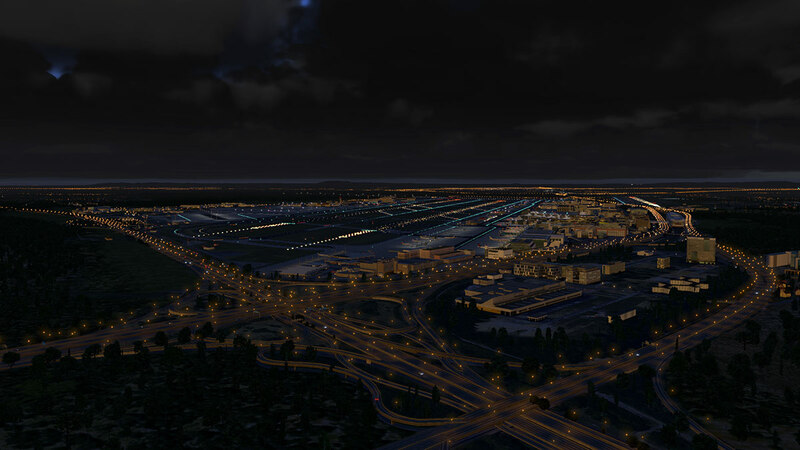 The airport has extensive WED ground routes that are highly modified for activity operations, and for me and throughout this review I have used the WorldTraffic3 plugin. 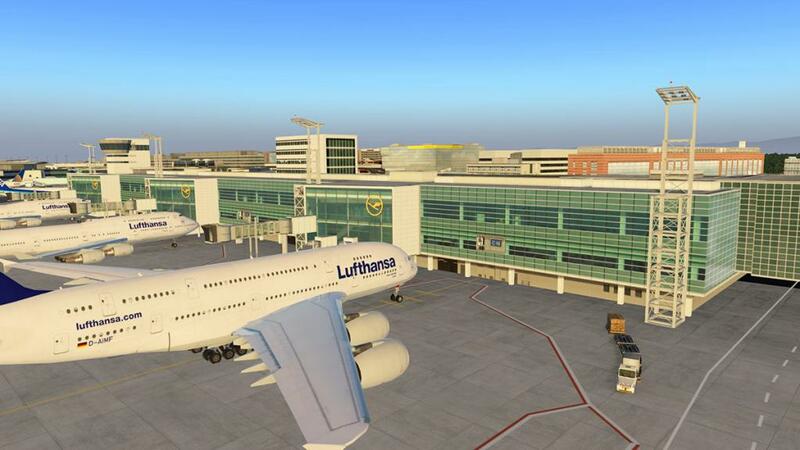 Set your clock to 8.30am Frankfurt time and watch them roll in and out, six A380's leave and two arrive in twenty minutes. 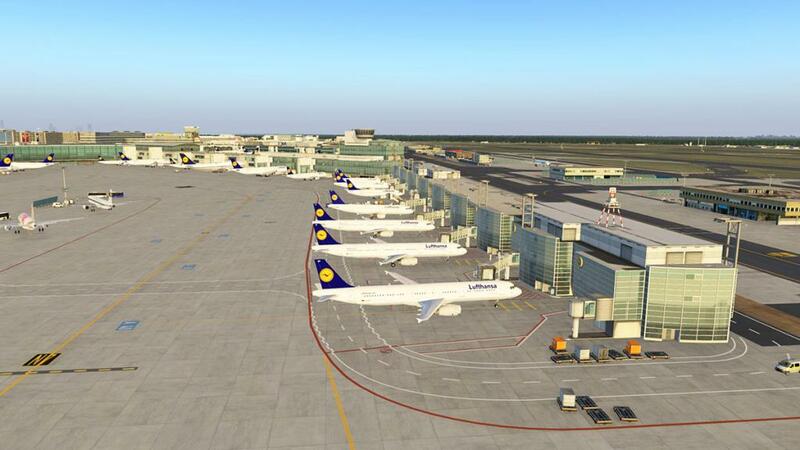 And all throughtout the day these aviation monsters arrive and depart from mostly Asia or Lufthansa's departing to America. 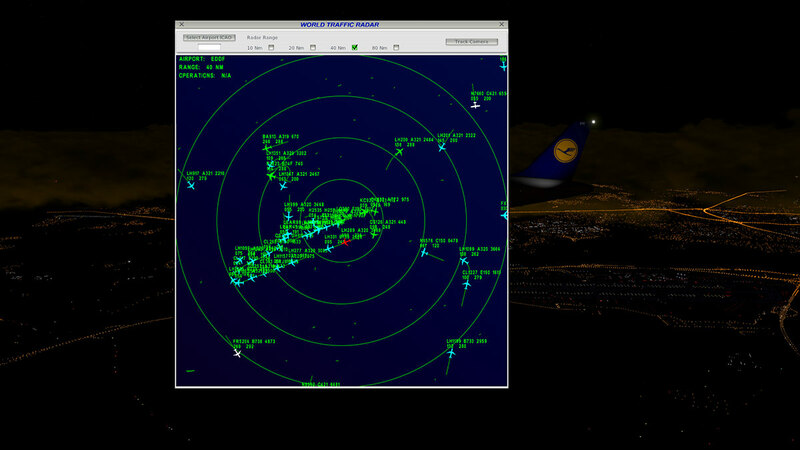 ... and EDDF is always running WT3 busy, busy day or night. But somehow they all land, find and park at a gate. If you want EDDF, then also purchase WT3 as they live together perfectly and go hand in hand. 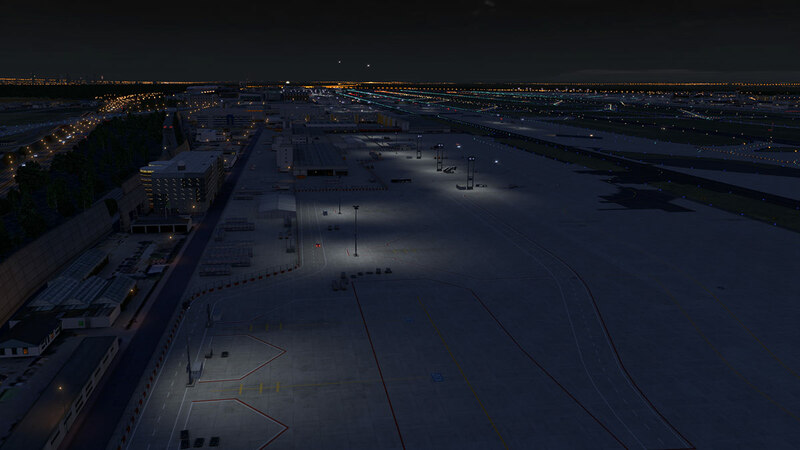 EDDF's lighting is excellent, and in some areas some of the best night textures you have seen. 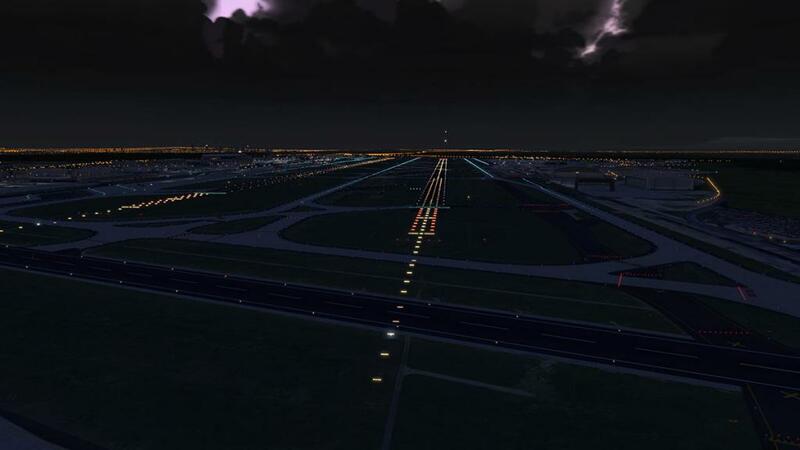 The airport lighting and the night traffic lighting combines to make any approach exciting. 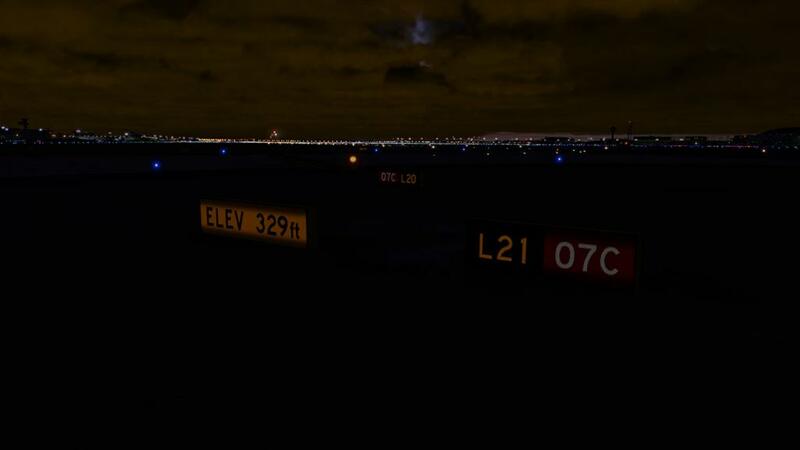 Runway and taxiway lighting is first rate and what you would expect from a major country hub like FRA. 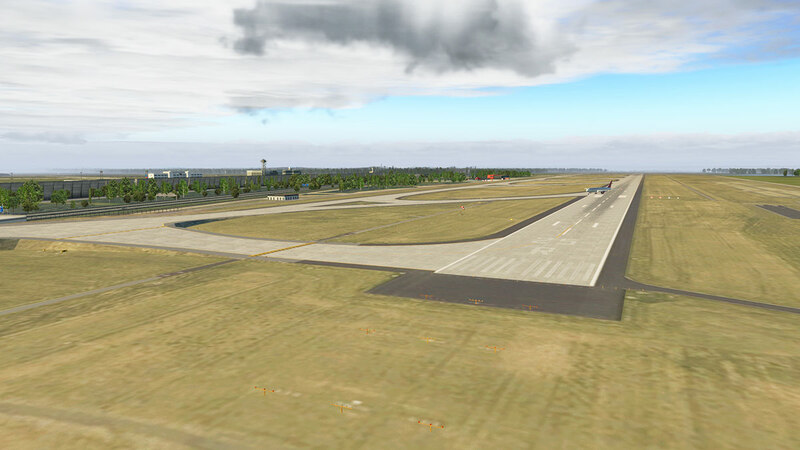 But the taxiway signage can be slightly dull, but is realistic. 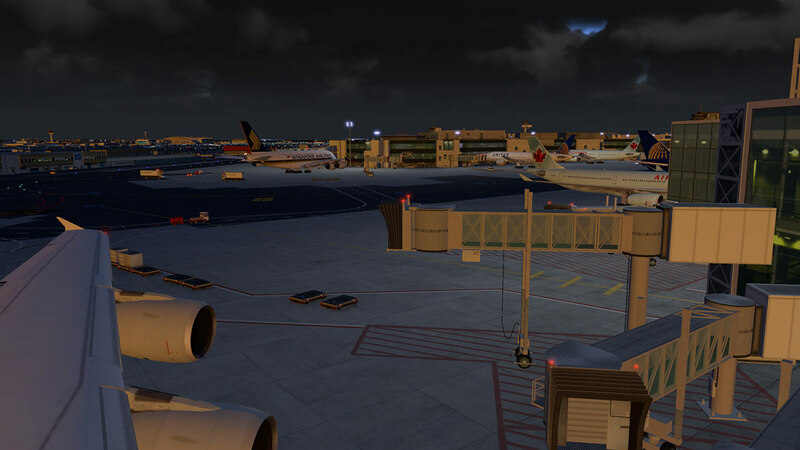 There is nice varied lighting and the ramps do look spectacular with great spot and throw elements. 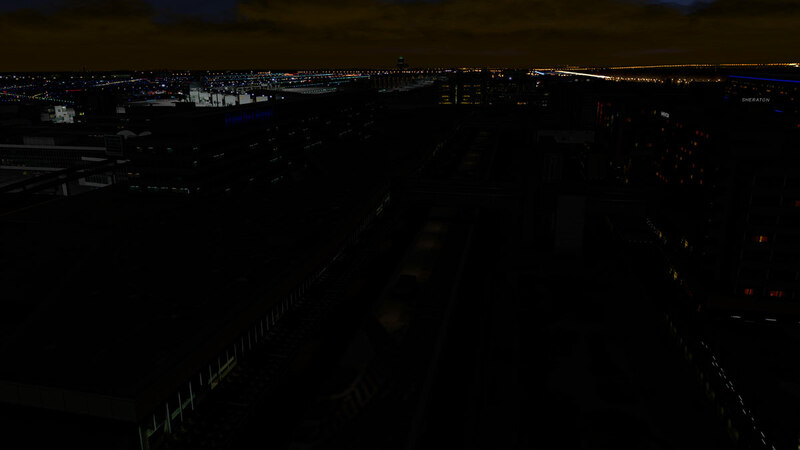 The only areas that are dark and should be lit are between the Hotels/Carparks and Terminal one, it is all in terminal darkness and not lit at all (below right)? 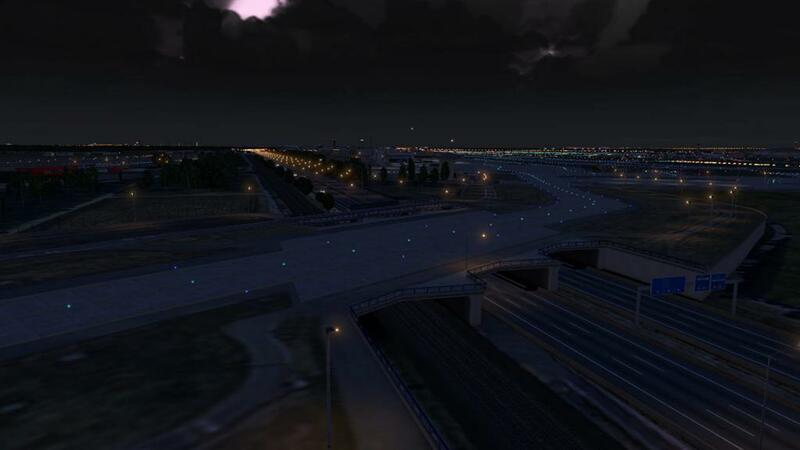 Again it is the what you don't see you don't need factor, but it is highly noticeable from anywhere in the air. For the main Terminals and ramp areas you have however the best night building textures and lighting you can get. 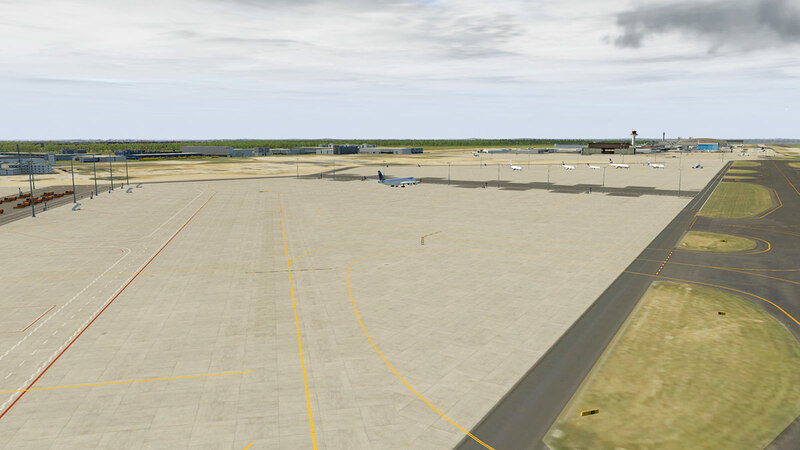 Anyone would welcome an arrival here with these excellent textures, and working on the ramps here is a breeze. Two other highlights are the lovely Lufthansa Technik hangar doors with a nicely lit Control Tower right next to it. 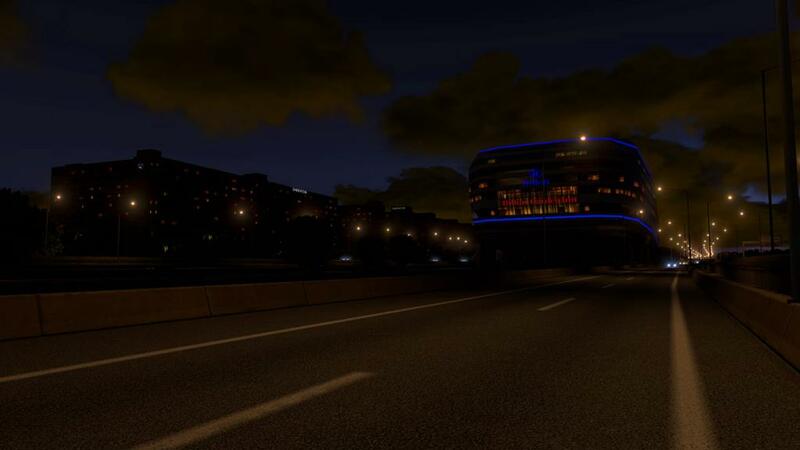 And the really well lit beautiful blue the "Squaire" and Sheraton Hotel. 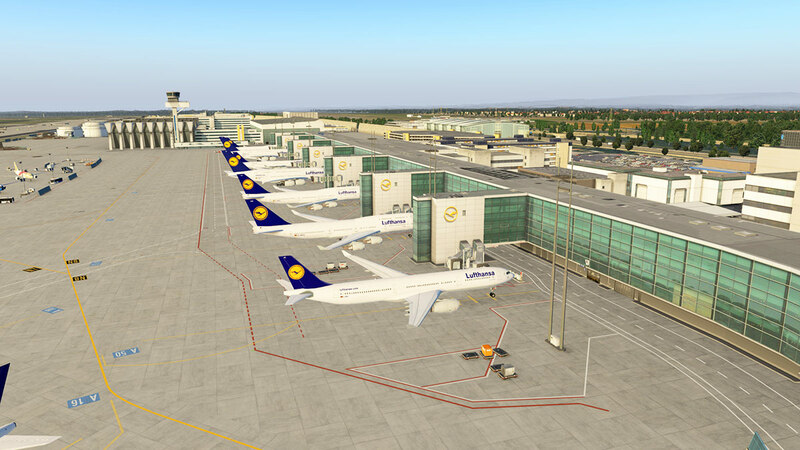 I could fill two pages of services for EDDF... Lufthansa LH of course dominates everything here but in reality you have everything from LCC's (LCC's mostly park on the South side) and there are stands and ramps for everysize and every type of commercial aircraft you fly. 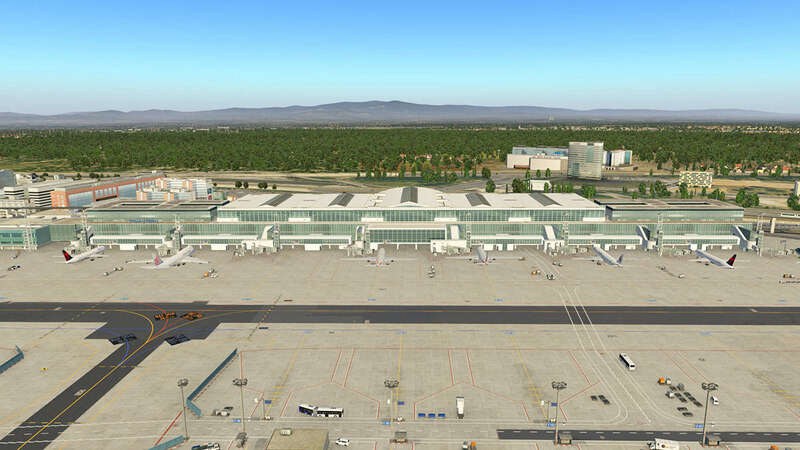 There is a very small area for General Aviation on the south side, but EDDF is all totally commercial and legacy airline operations hub right up to those huge A380's. 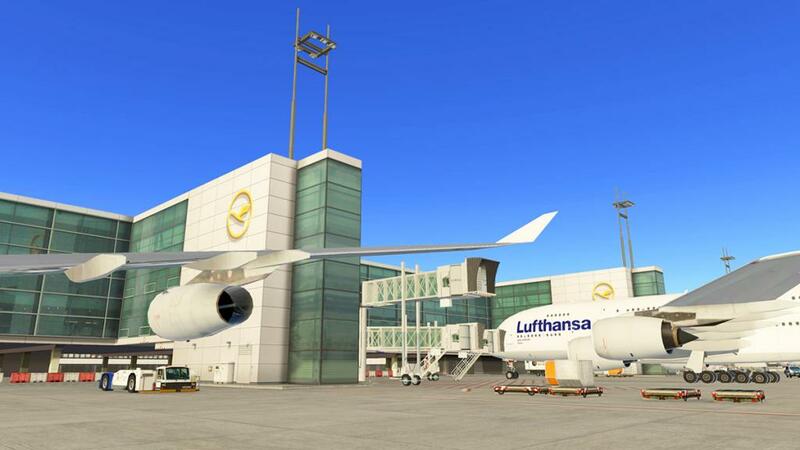 Cargo is the same with Lufthansa Cargo the main tenant, but there is ramp space and parking areas to use to fly to any haulers destination in any operators aircraft. 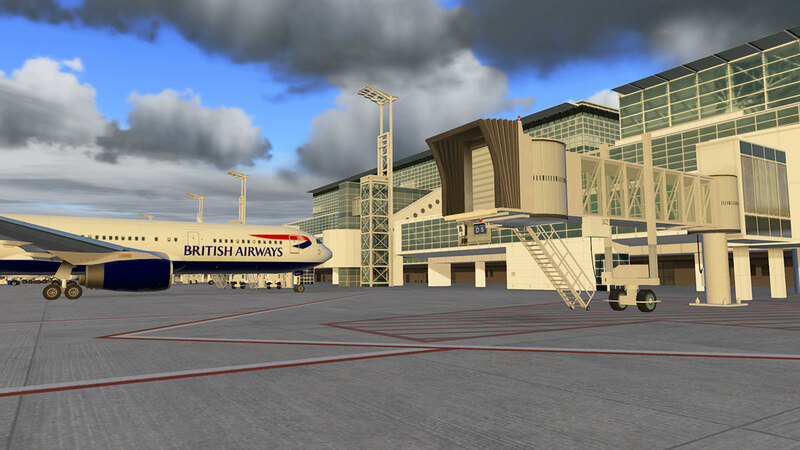 In other words it is one of the best cargo hubs in the world. 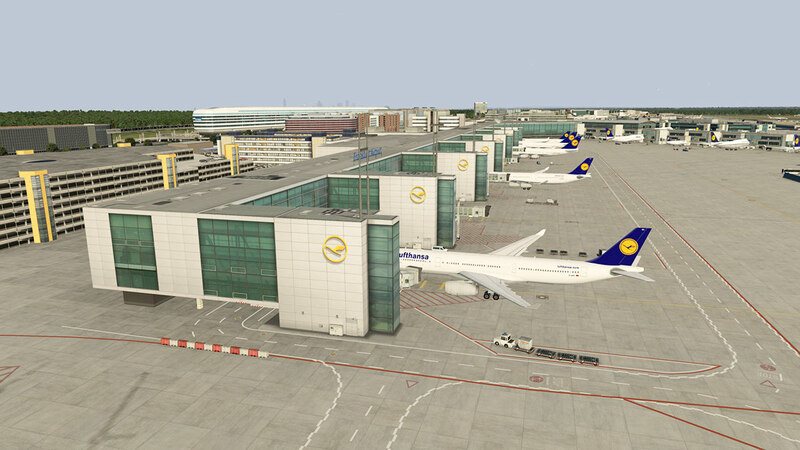 Frankfurt EDDF is a huge German Hub and this scenery is just as mammoth in its scale and content. 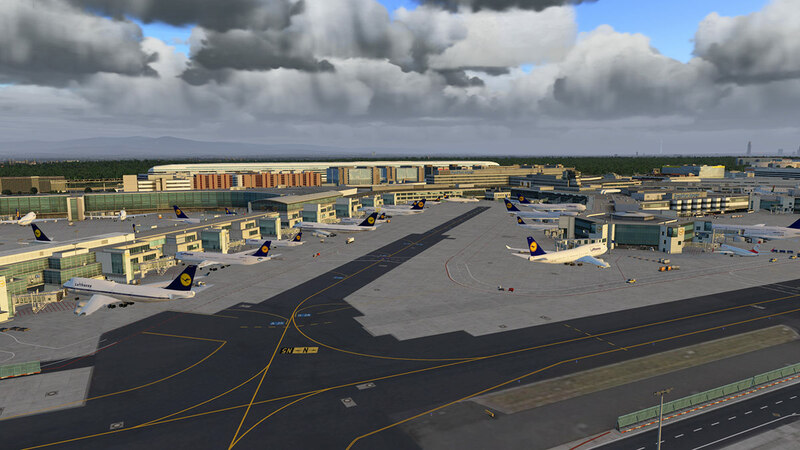 Yes Aerosoft's FRA does have that huge wow factor, but it is in the finer details that makes it really stand out above the crowd. 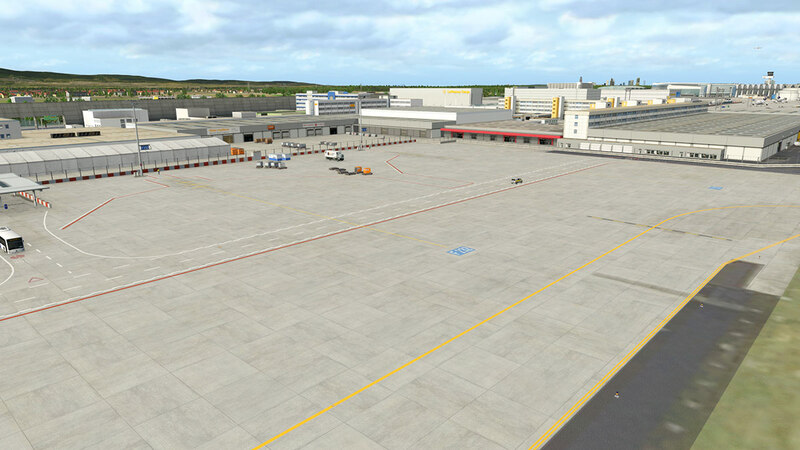 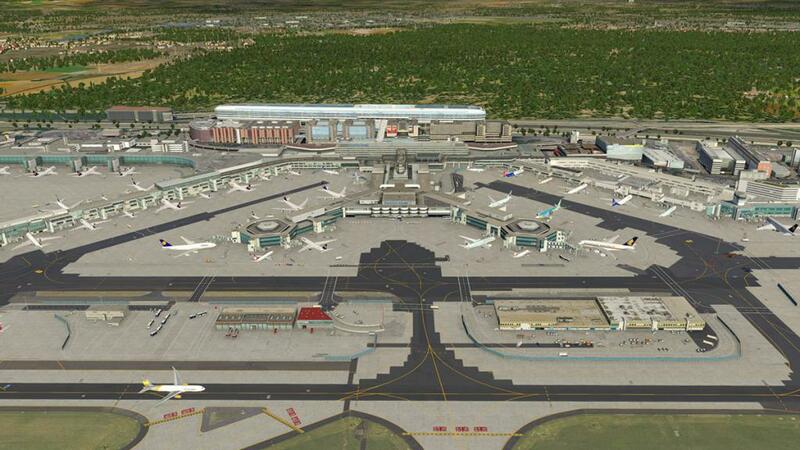 Aerosoft in reality has for years delivered airports of this scale and quality. 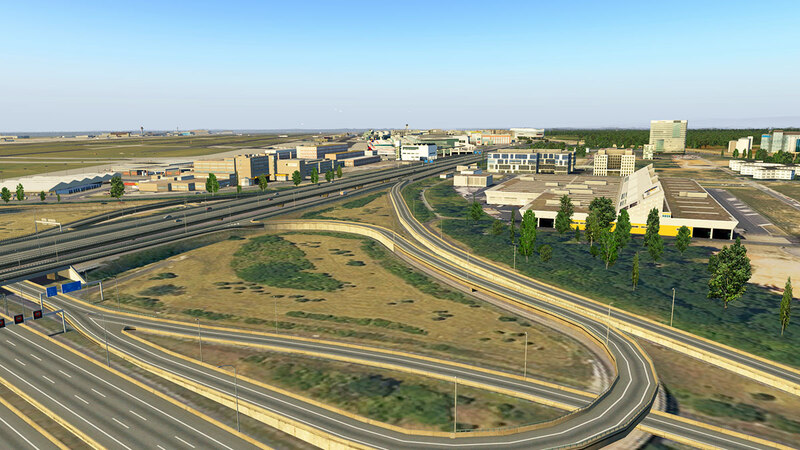 But the scenery was missing that certain vital element to make them first grade. 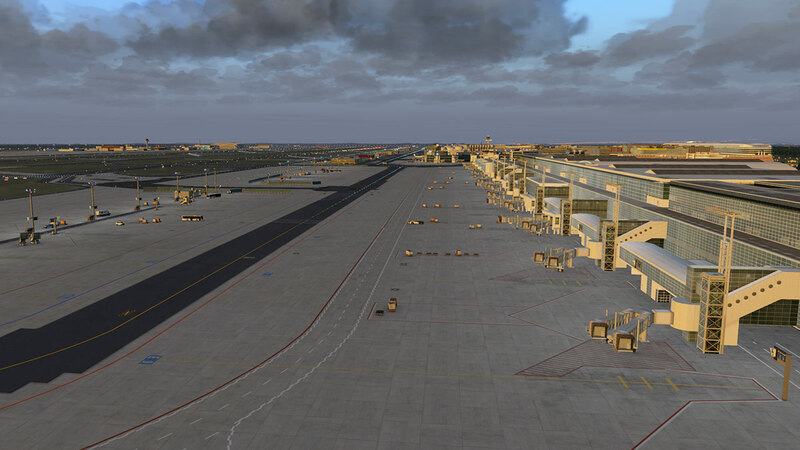 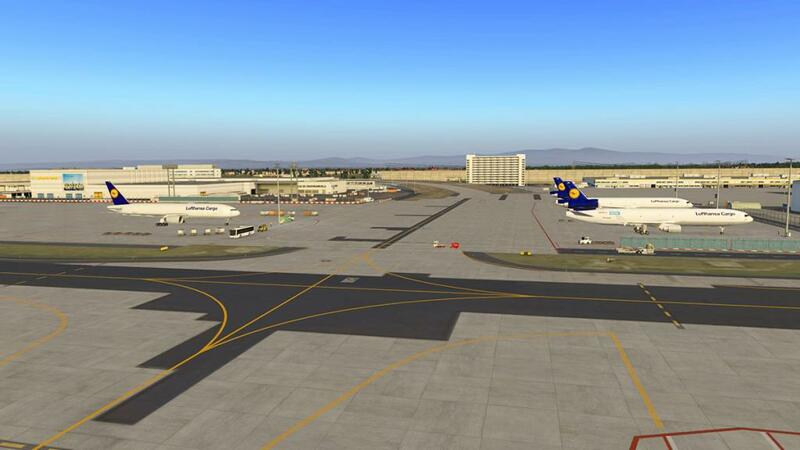 Here with Omar Mansoor's input and skill, he brings EDDF alive like only X-Plane11 can with ground airport traffic, A-VDGS animated gates, lighting and excellent laid out ground routes, add in the WorldTraffic3 action and you have a blockbuster of a scenery. 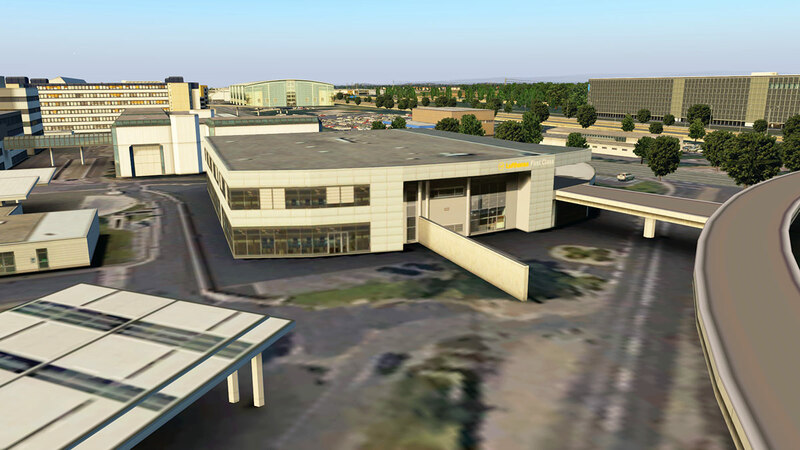 All the main modeling and 3d work is exceptional as is the landside building fill as well. 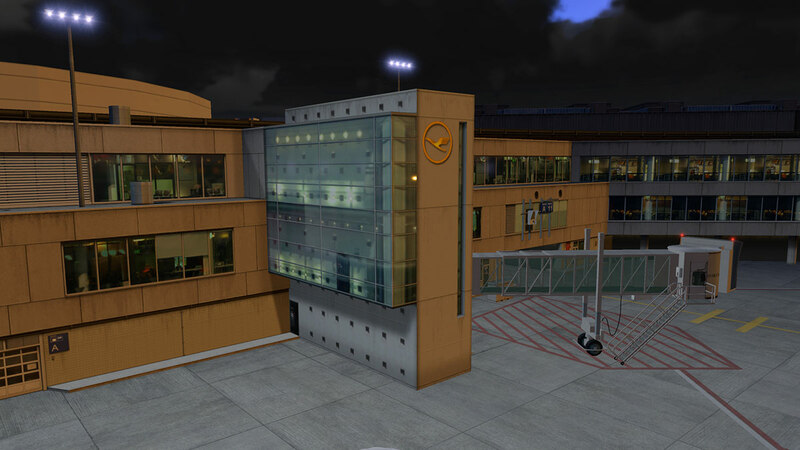 Detailing and the sheer object count here should bring your computer to its knees, but EDDF doesn't do that because of the lighter ground textures and none overfill in areas that don't require intimate filling just for the sake of having it there. 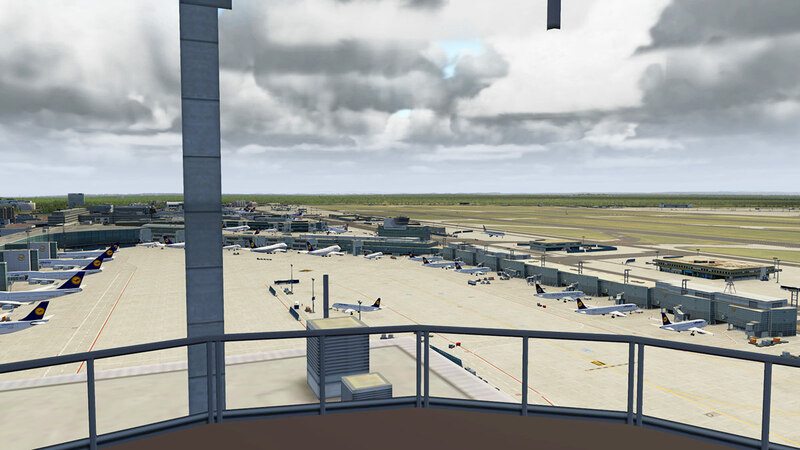 With this size of object count the scenery is excellent on frame rate, but there is still a lot of objects in here and so even I use the one step down of object (graphic) setting to not to ruin all the action... overall the scenery is excellent on frameweight within reason. 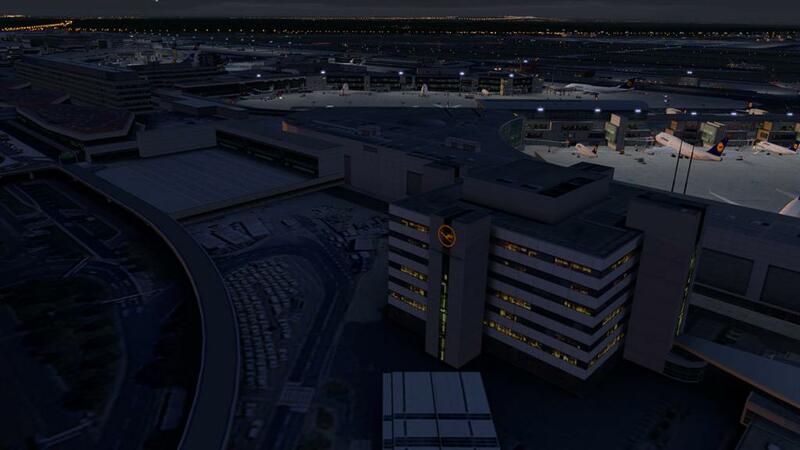 Building Hi-Resolution textures are some of the very best in the business, in the day or night as is the runway and taxiway textures, signage and layouts. 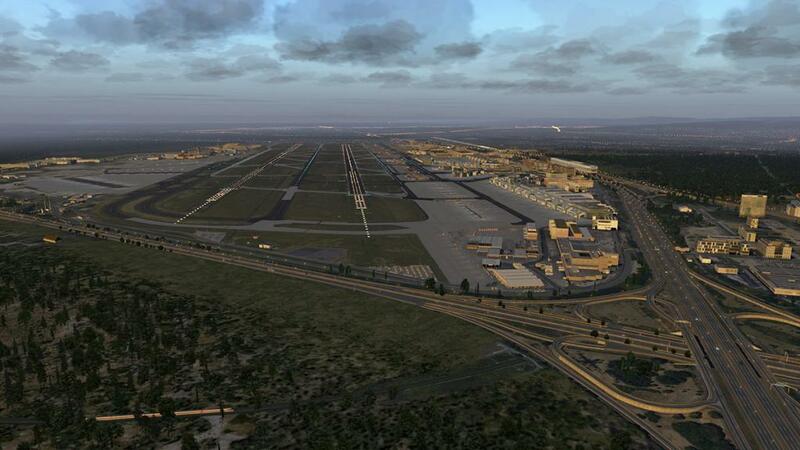 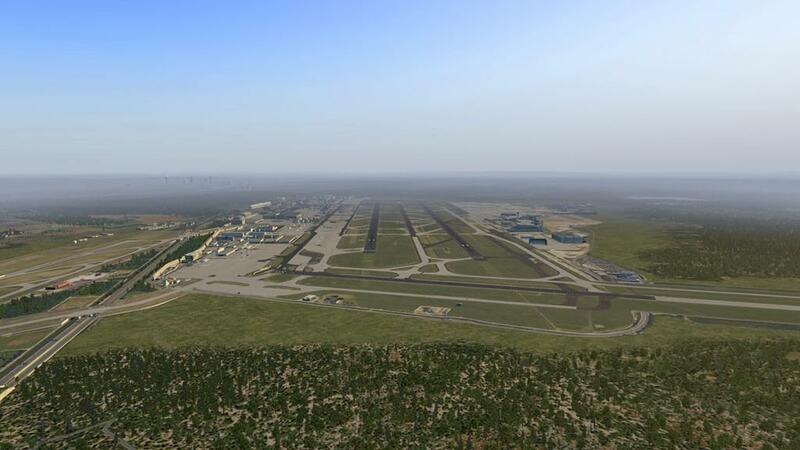 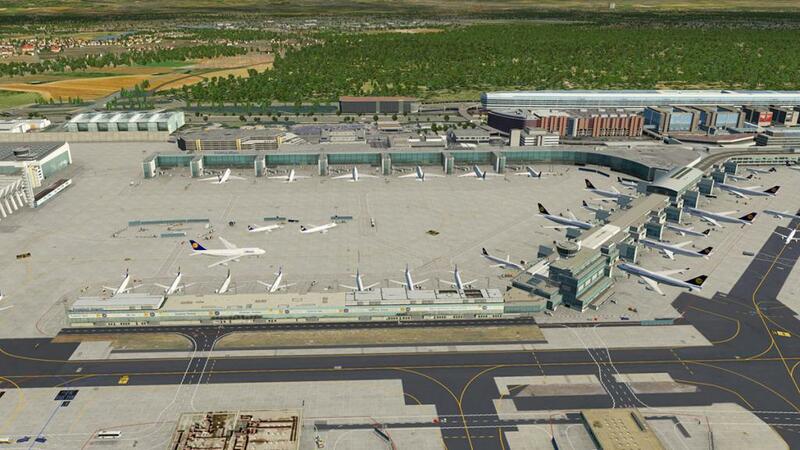 All round Aerosoft's EDDF - Frankfurt is the best future of X-Plane scenery that you will get today. 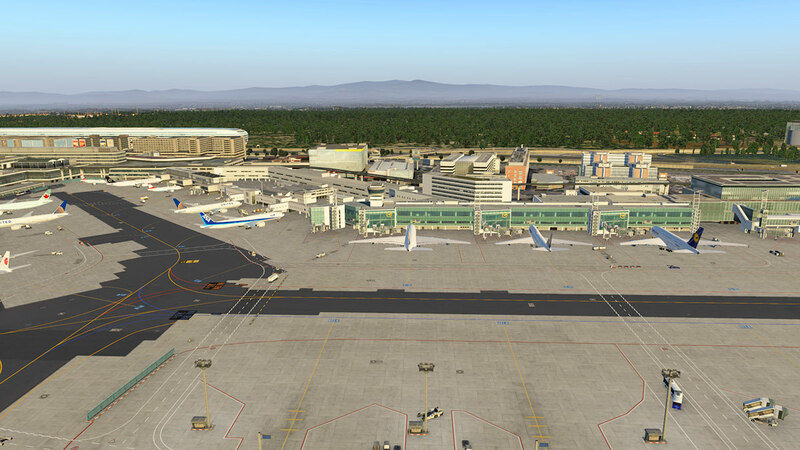 The deal is that it is the most complete scenery in every area of a large commercial airport (not to be compared with a small highly -detailed scaled airport) as sceneries of this size usually come with some sort of compromise, but EDDF doesn't have that compromise, it has everything, and delivers everything you want in a major hub of a scenery. Invest in EDDF and be sure of a lot of use and enjoyment out of this excellent part of your X-Plane flying... If you fly in Europe or fly to Europe then you will need EDDF Airport Frankfurt... it is just as simple as that. 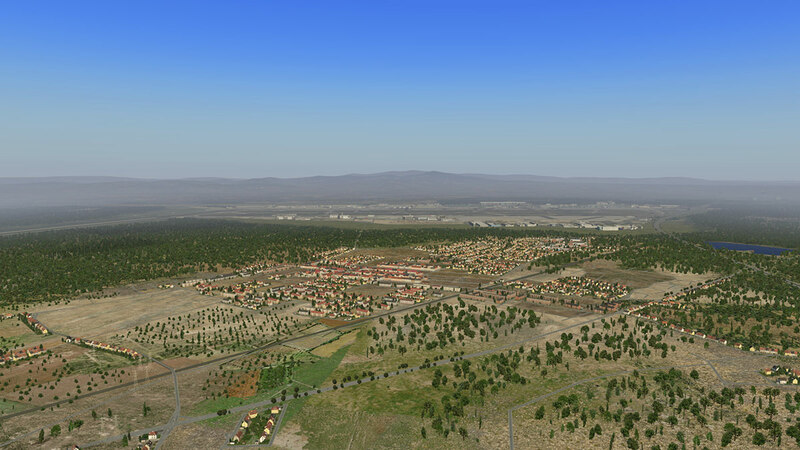 Installation : Download scenery file size is 134.40mb. With the full installation listed below in your custom scenery folder. 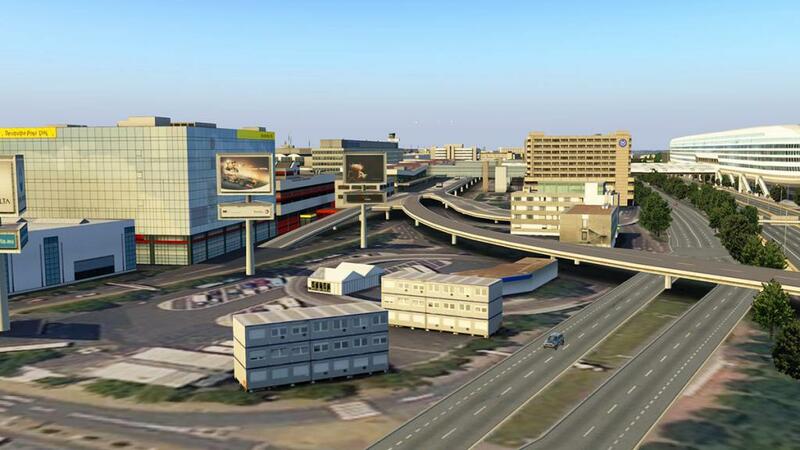 Parked Cars and Roads can be turned off to save framerate, but the saving is small. I recommend using the Frankfurt/Main VFR scenery for the Frankfurt city skyline, download link is below. 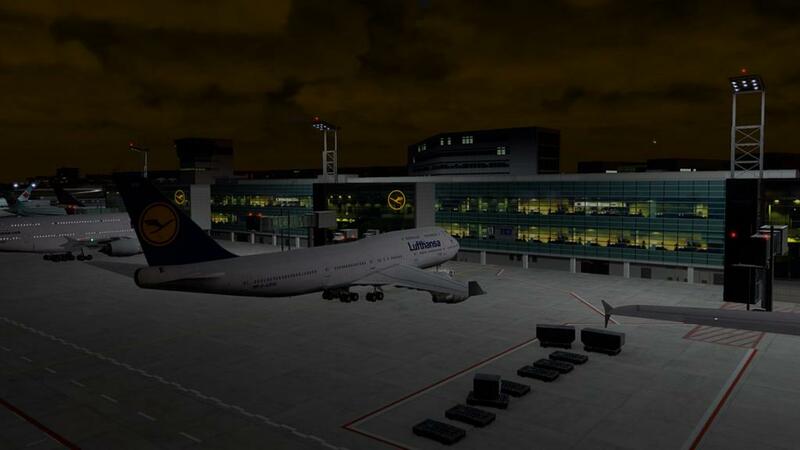 Great visually but no LIT textures at night? 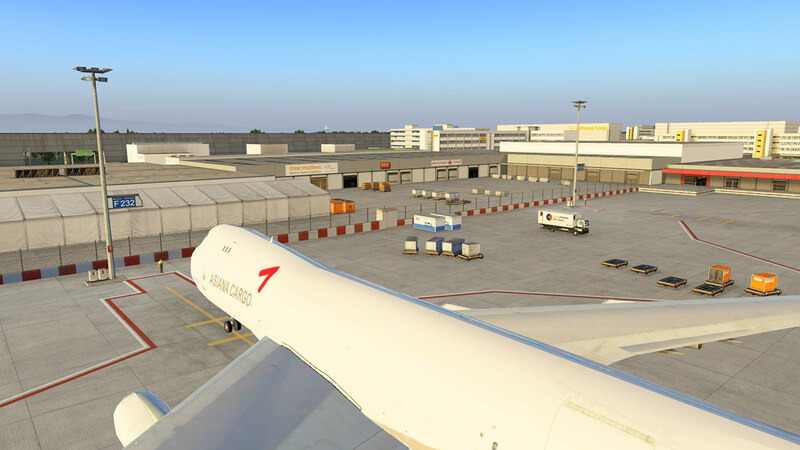 WT3 : WorldTraffic3 ground route conversion is absolutely excellent and activity is perfect... Full cargo and lots of A380 activity with real time AFRE arrival and departures... a must have for this scenery! 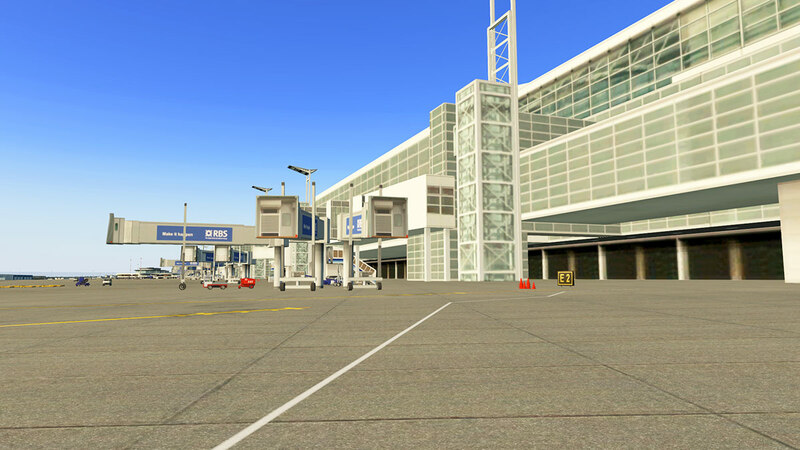 WT3 compatible is a huge plus for me! 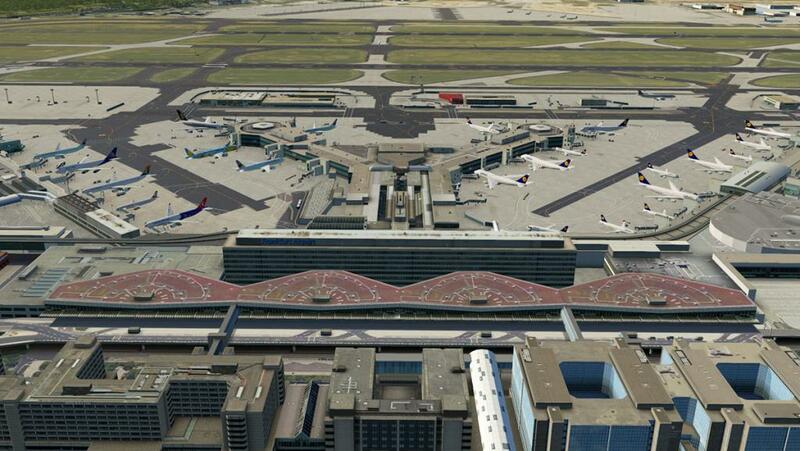 Not sure my computer can handle it, but I might have to get this airport just to watch everything in action. A380's would be a blast to watch. 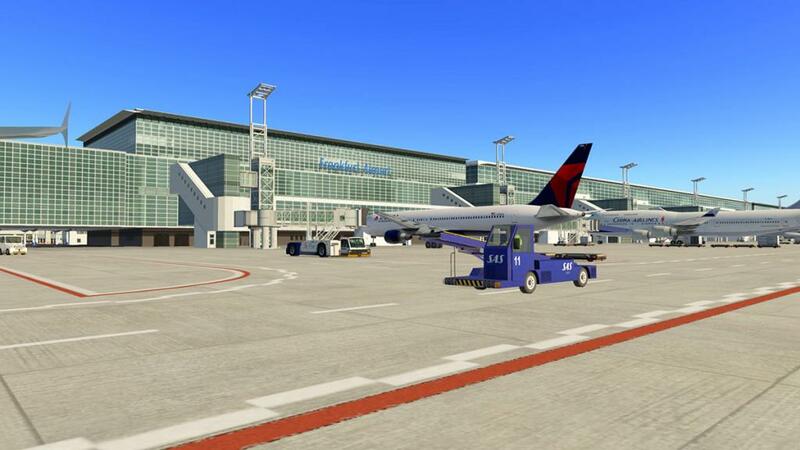 I genuinely thought these pictures in the review were stock placed aircraft. 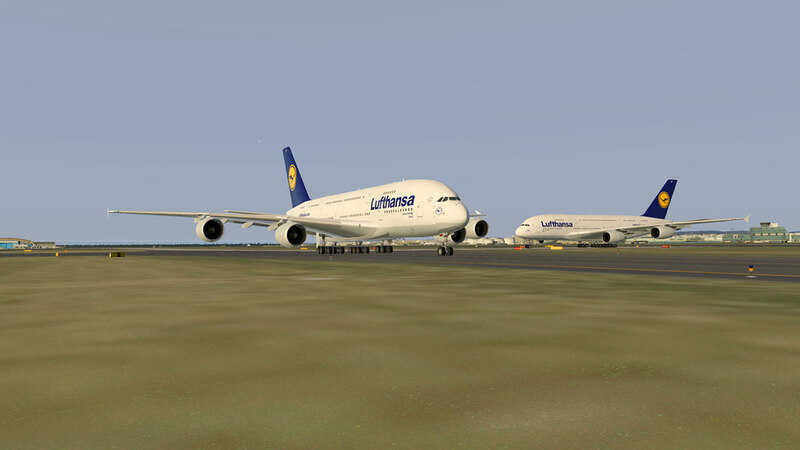 No they are the actual WT3 A380's in the images, and when you get six of them crawling around you see and feel them... A trick is not to put your sliders too high or generate a lot of routes, EDDF will still fill up to capacity even with WT3 running half-settings, and just pull back the Flight Plan Load radius as you need very little surround activity as EDDF is very busy anyway... enjoy! What an excellent, thorough review. Thank-you. 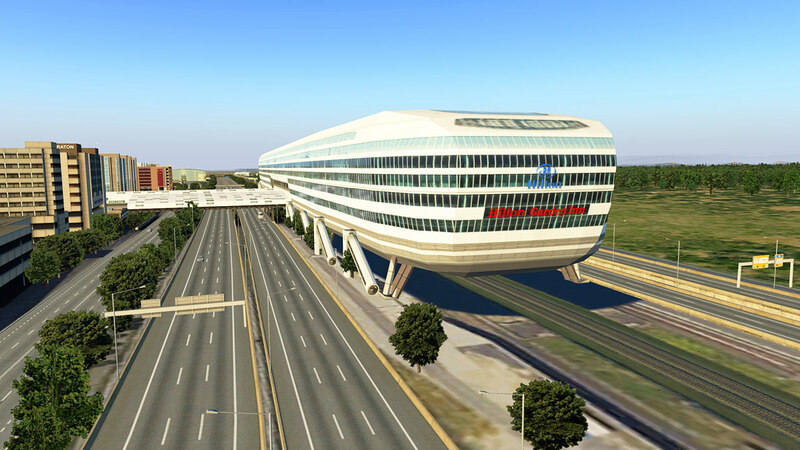 Signed up to the site on the strength of this content.